I’ve just re-read the last line from my last post, which I wrote around a year and a half ago. It feels peculiar reading those words now. They are the words of someone who was hugely motivated by speedflying. Someone who was excited about progressing onto faster more agile wings and performing more and more technical maneuvers. 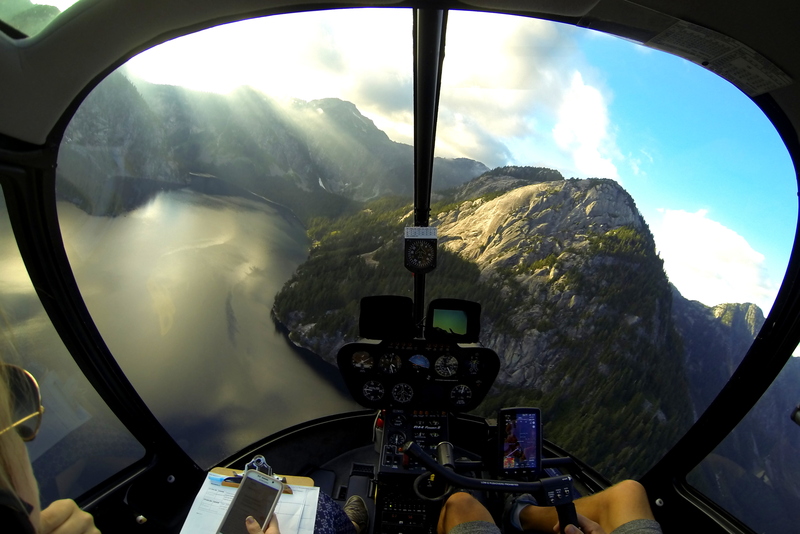 I was dreaming up future trips with my brother and friends who also speedfly. As far as I was concerned speedflying was going to be a very significant part of my future. Skip ahead to the present. 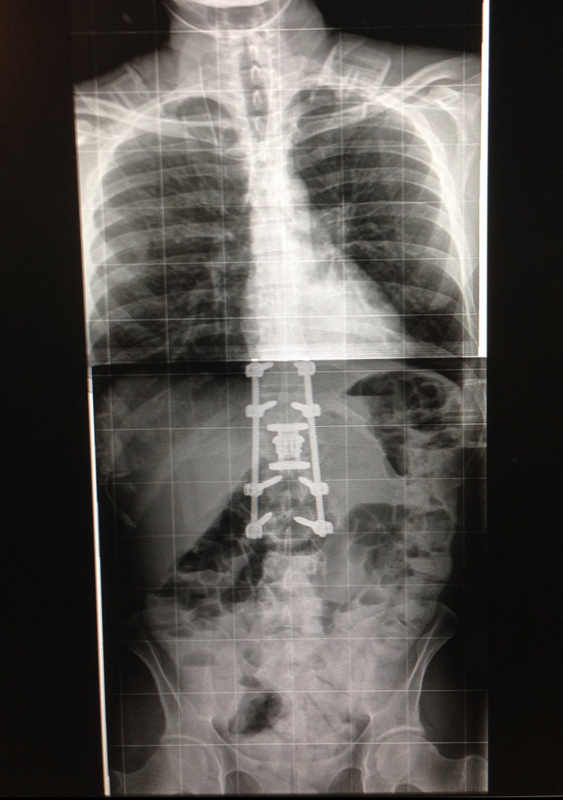 I’ve sold both my wings and my brother has one less vertebra and a whole lot of metal holding him together. This isn’t what I’d pictured! I could write a VERY long blog post on how we got to this point but I’m going to try and keep this brief. 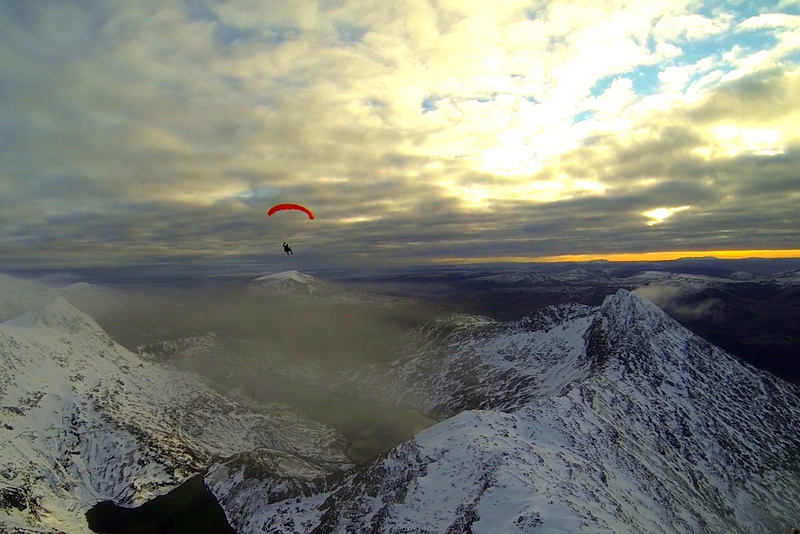 My brother Niall crashed whilst flying with me in the Brecon Beacons. Actually, to be more accurate I hadn’t yet launched when it happened. Niall was pulling big turns on his descent down the steep mountain face when something went wrong. We still don’t know how it happened, but he impacted at 40-50mph instantly bursting his L1 vertebra. He then tumbled off a cliff and broke a further four vertebrae as he somersaulted down a boulder field. I reached him less than ten minutes later to find him trying to stand and insisting that there was no need to call the emergency services. I already had of course. Over the next hour or so, as the adrenaline wore off, it became apparent that Niall was seriously damaged. I can’t even begin to describe how upsetting it is to see someone you love so broken and in so much pain. He asked repeatedly for me to remove the rock that was digging into his back but I couldn’t find any rocks. We found out later that he’d snapped off a piece of his scapula giving him the sensation of having something sharp sticking into his upper back. With Niall resting his head on my lap we chatted whilst waiting for help to arrive. We were both in agreement that this had to be the end of our flirtation with speedflying. Over the years I’ve become more and more aware of how much stress I put my family through by pursuing dangerous, adrenaline based activities. 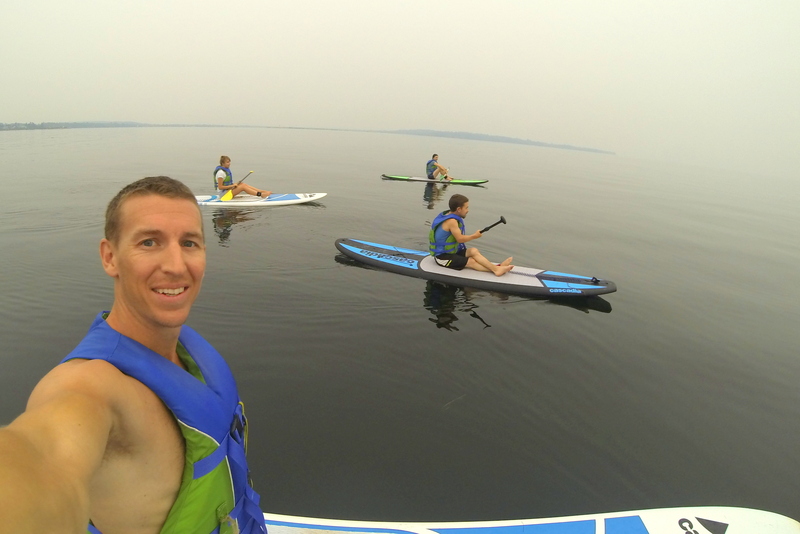 As much as these activities have enhanced my life, they’ve had the exact opposite effect on my family, and there comes a point where it’s just selfish to keep on pursuing such goals. I have no doubt that had we both continued to speedfly there would have been more accidents at best, and at worst one of us would have died. It’s a shame that it took such a serious accident for us to come to this realisation, but better late than never. Niall was winched into the AW139 SAR Helicopter in a combined effort from the Brecon Mountain Rescue Team and the St Athan HM Coast Guard team. 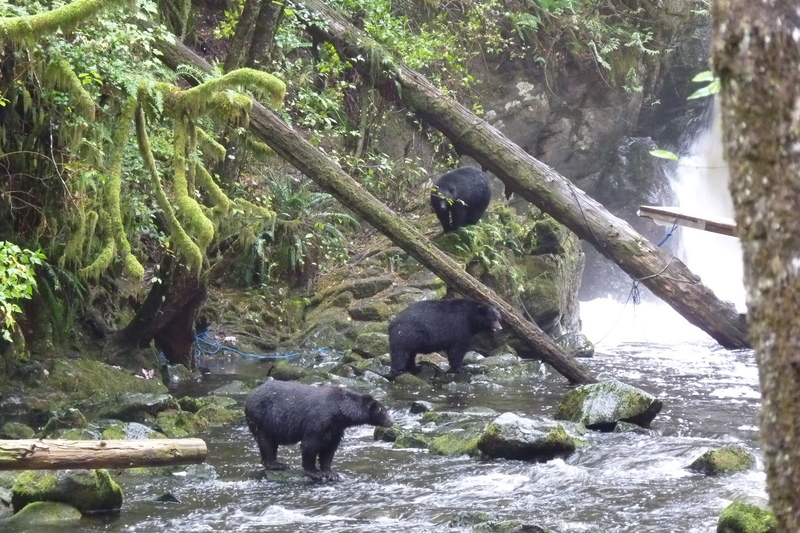 Despite the circumstances it was fascinating to witness the whole process. At this stage I was studying full time to become a helicopter pilot and it was a real inspiration to see everyone in action. Forty days later Niall left hospital for the first time since his accident. It hadn’t been a pleasant experience for him. 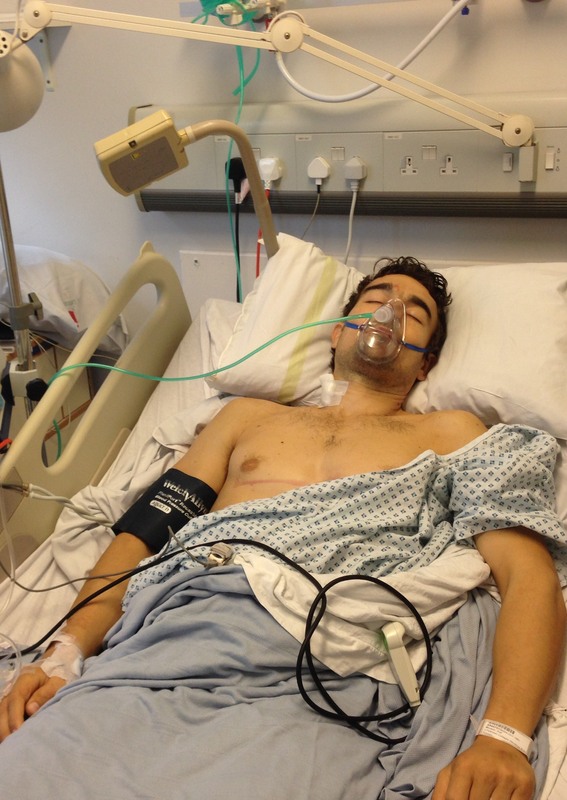 He’d undergone two major operations which not only involved re-building his shattered spine but also cutting out a large amount of his lower back muscle which had become necrotic in the immediate aftermath of his crash. The surgery combined with the cocktail of drugs he was being fed resulted in his gut shutting down and constipation setting in. This undeniably led to the second crux of the ordeal where – after nearly twenty days without going to the loo – the immense pressure in Niall’s gut was torture for him. As with all epic battles this one ended with a spectacular crescendo after which Niall was left lying in twenty days worth of liquified hospital food with a Cheshire Cat grin on his face and a dismayed nurse at his side! So, lets come back to the present. Niall has come on leaps and bounds, quite literally. He lives with partial paralysis down the backs of his legs meaning that he walks with a very different gate from the Niall of old, but despite this he is phenomenally mobile. Testament to this is the fact that he is now a fully-fledged member of the Brecon Mountain Rescue Team, which is no mean feat. His injuries have left him unable to control the muscles associated with his bladder and bowels, a fact that would most likely be the source of significant embarrassment for most people but is the source of great amusement for Niall. He copes with these new challenges stoically and with an impressive air of cheerfulness. As for me, I’ve now been living in Canada for over a year with Lucy. 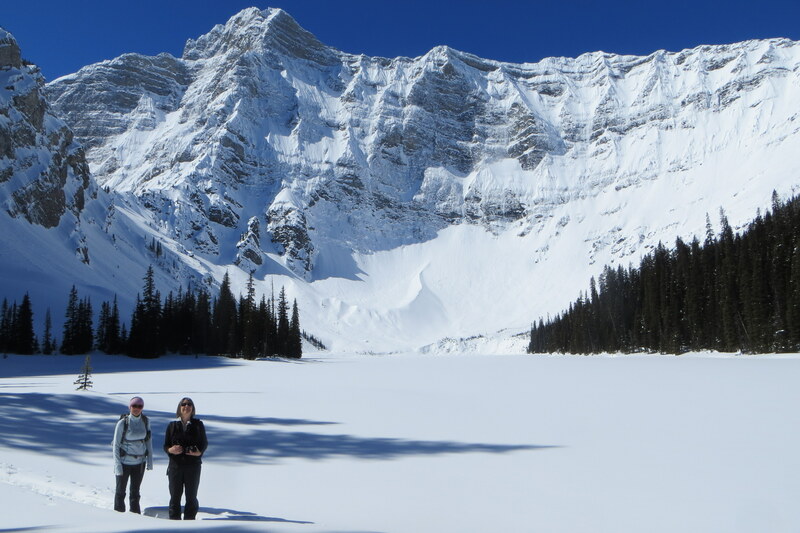 We started off in Calgary where I completed the Commercial Helicopter Pilot Course and Lucy worked her socks off as a nanny for two wonderful families. We were very much living pay cheque to pay cheque but were happy nevertheless! In March I started working as a pilot for Global News in Calgary and shortly after transferred over to Vancouver which is where we are now. Life in Vancouver is wonderful. We have the Pacific Ocean and the Coastal Mountain Range right on our doorstep, plus of course Vancouver Island is just a short and very convenient ferry journey away. Lucy is still working like a Trojan whilst also studying full-time to become a Certified Nutritionist. I couldn’t have done any of this without her by my side. 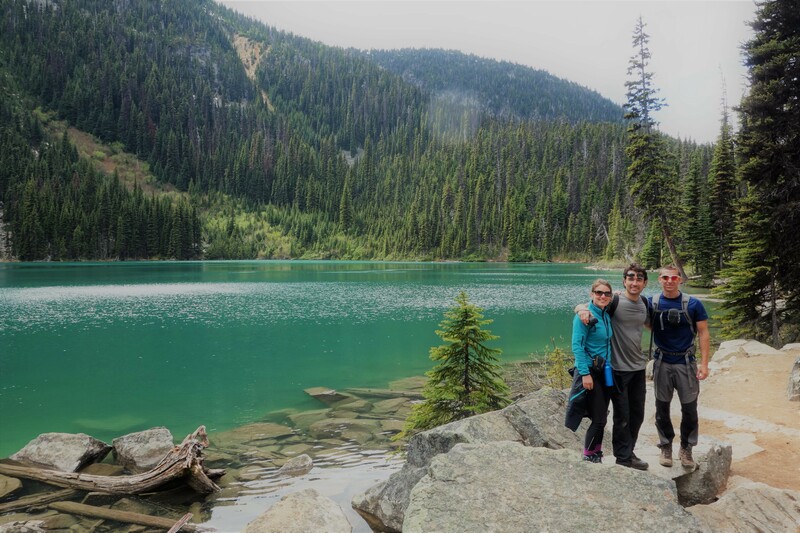 We’ve enjoyed having our family come to visit in regular little installments every few months, each time giving us an excuse to go off on a little adventure! Life is full of twists and turns and sometimes it takes a wrong turn to get you to the right place. Most importantly, we’re all still here and we’re all still living life to the full! The direction may have changed but the pedal is still firmly pressed to the floor. As the title of this post would suggest I’ve managed to get out on the speedwing a little more so far this year. 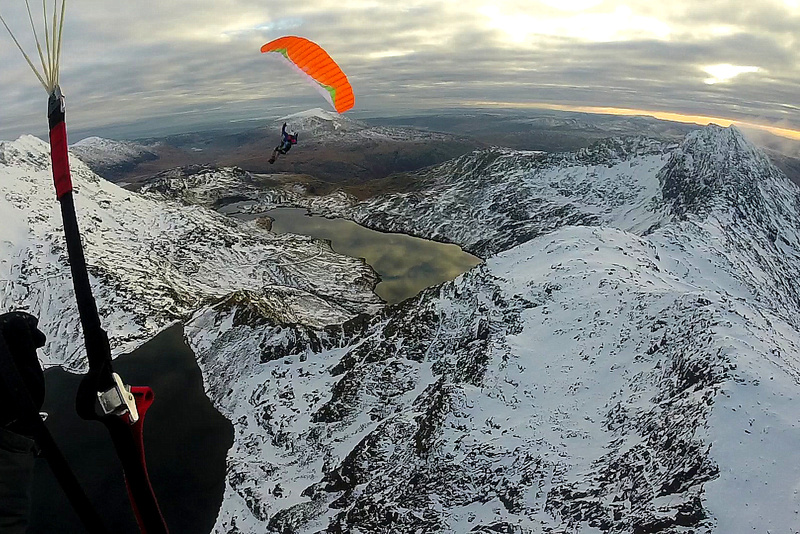 Niall and I had a stunningly beautiful flight off the summit of Snowdon in very snowy conditions and almost nil winds. 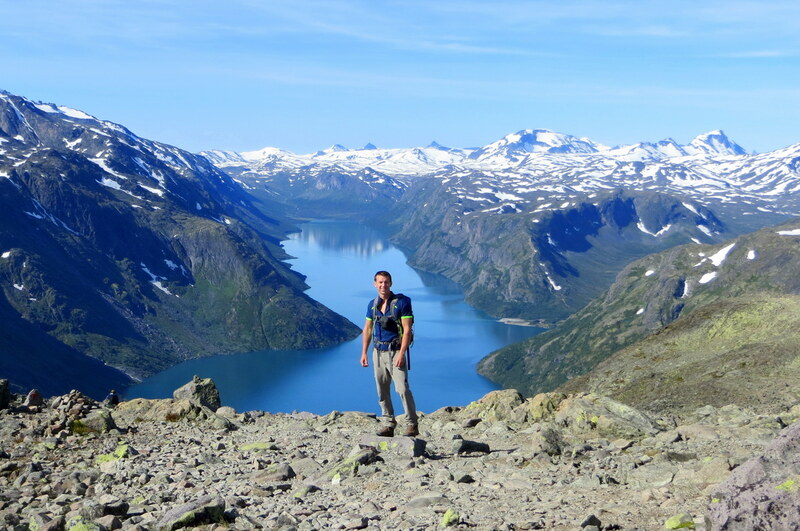 We flew down to the lower lake – on the east side of the mountain – covering 2.4km and losing 625m of height. We also had a fun morning flying on our local hill Caradoc with our friends Dan and Nida. This was Dan’s first flight back after an accident which left him with a broken cheek bone, six fractures to his jaw and a few wonky teeth; so it was great to see him on the wing again getting back into the swing of things! The flying highlight so far this year was a flight off the summit of Crib y Ddysgl (Snowdon’s sister summit) with Waldo Etherington. We flew down the north side of the mountain into the Llanberis Valley with a total descent of 900m (2950ft) in approximately 2 minutes! 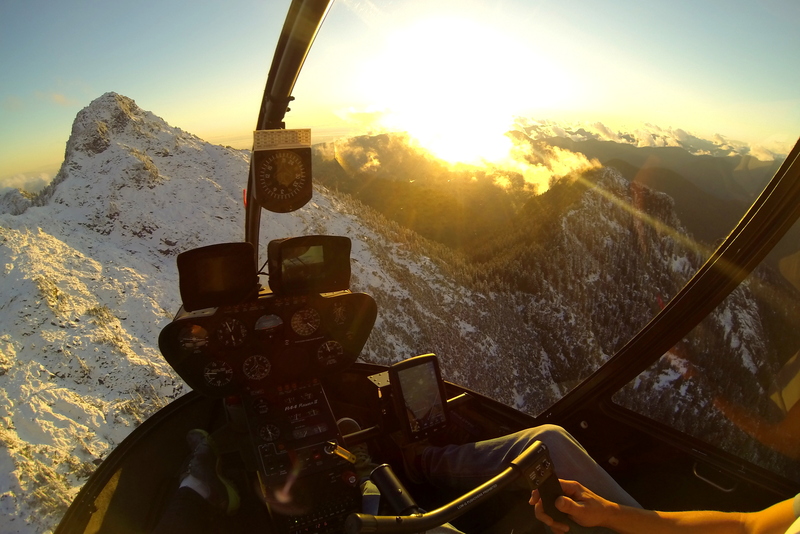 The video below is my head cam footage from this flight. 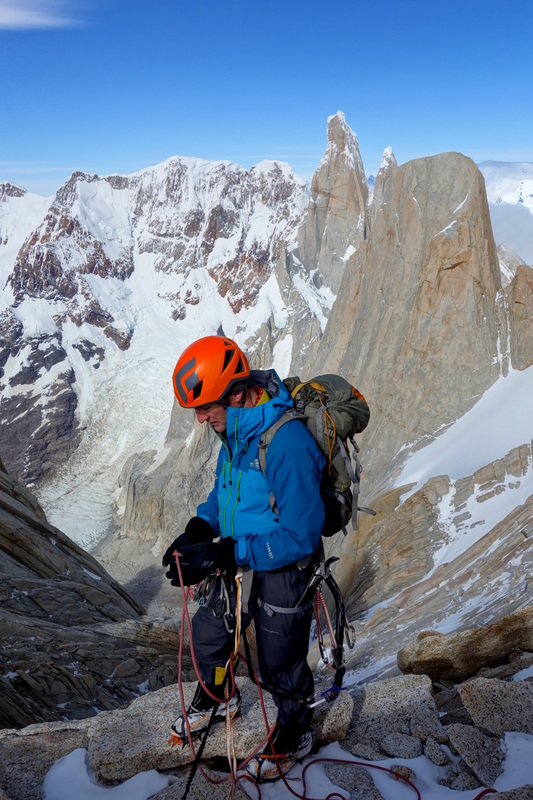 Rather than heading up to Scotland to celebrate the New Year as I traditionally do, this year I flew out to Patagonia for a smash and grab trip to the stunningly beautiful and epically steep Fitzroy Massif! The trip was my climbing partner Wilki’s idea and sadly is likely to be our last serious adventure together for some time; the reason for this being that Wilki is making exciting plans with his wonderful wife Sarah, and the lovely Lucy and I are moving out to Canada where I’m going to be training as a helicopter pilot. Wilki has been the most incredible climbing partner for me over the past 4 years and I still can’t believe just how productive we’ve been over such a short period of time. 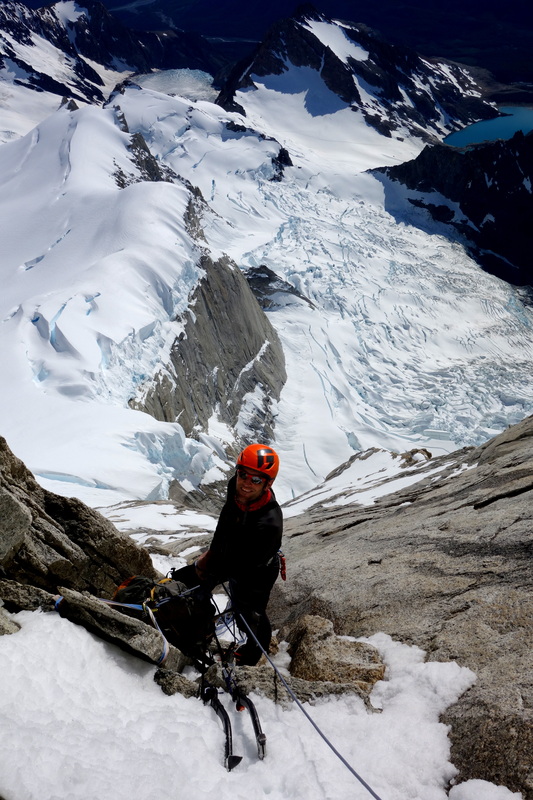 Highlights have included climbing the North Face of the Eiger, summiting the Lotus Flower Tower, launching our speedwings down the North Face of the Midi, and countless misadventures which I can now look back on with a great big smile! 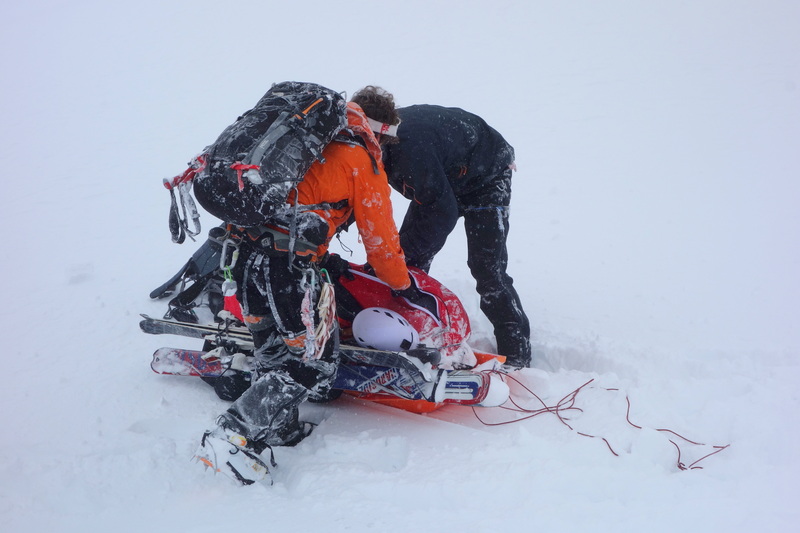 All this thanks to a storm in Greenland which gave us the opportunity to get to know each other. Anyway, enough of this soppiness! 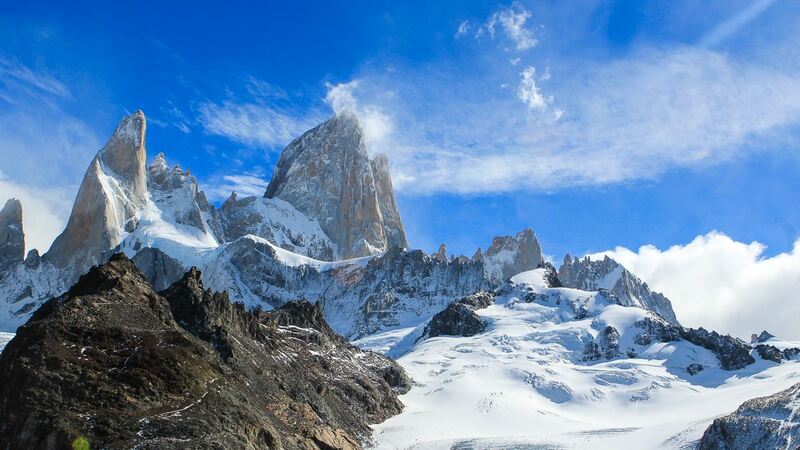 When climbers head out to Patagonia they usually stay for 4-6 weeks to give themselves as good a chance as possible of getting a weather window big enough to bag a summit. 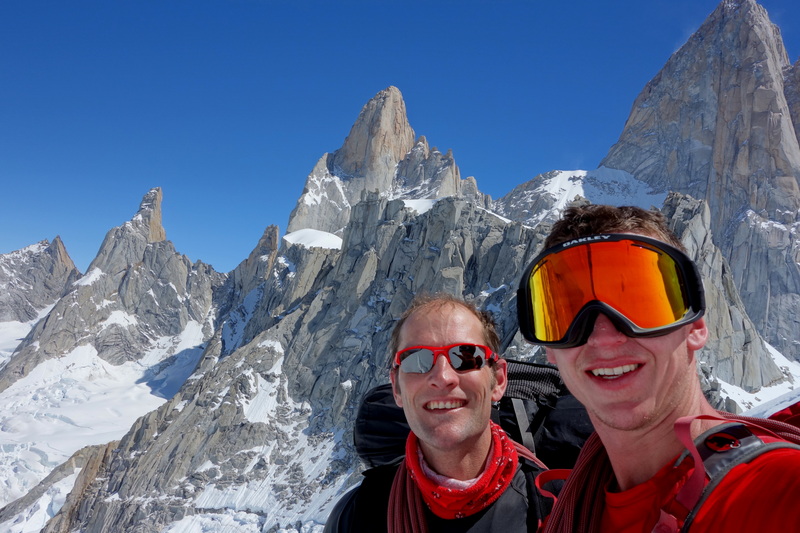 Due to work commitments Wilki and I had just 7 days in the Fitzroy Massif and we knew that we were taking a huge risk in going out for such a short period of time. We arrived into the village of El Chalten – from where all climbing missions in the area begin – at 5pm on December 30th after 47 hours of travel and next to no sleep. Crucially though, the sun was shining. A weather window had opened up the previous day and was due to last less than 36 hours longer. 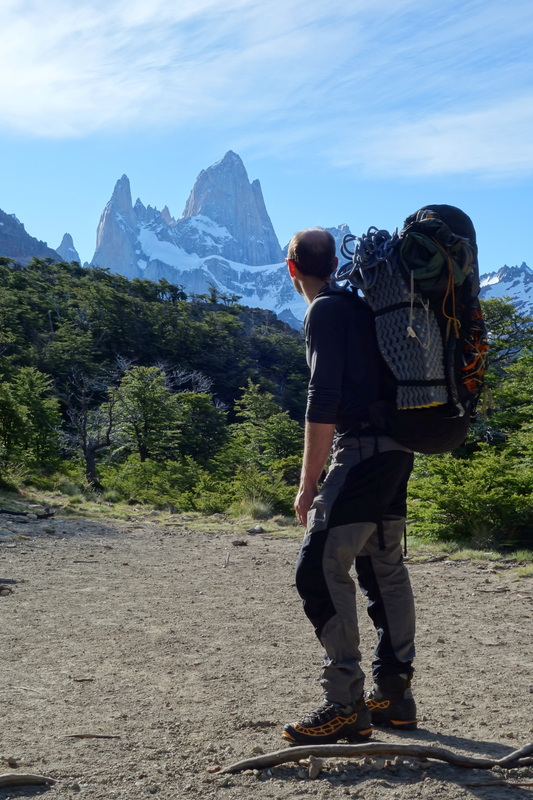 There was no time to lose, so despite our fatigue we packed up our rucksacks and within the hour started our hike up towards the Laguna de los Tres where we could set up a camp. After hours of hiking and a quick bite to eat we got into our tent at 11:30pm with our alarms set for 2:00am. We felt like zombies as we set off after no more than 2 hours of broken sleep. 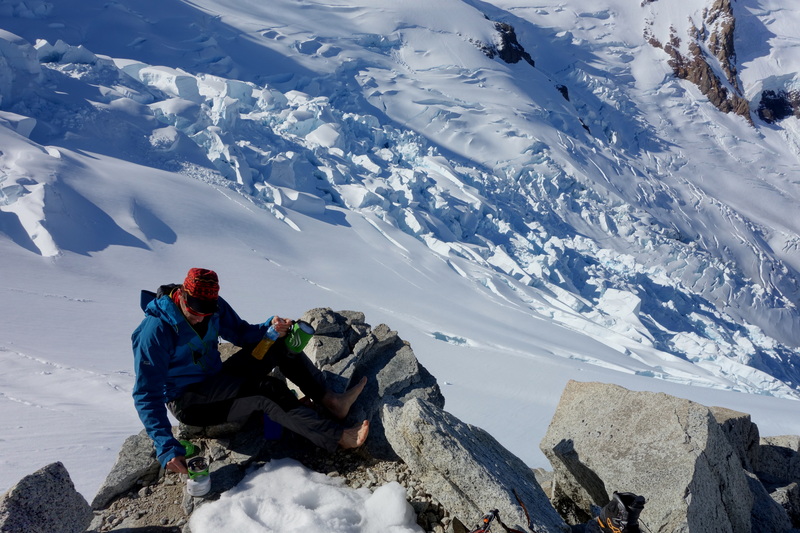 Wilki was convinced that he fell asleep on his feet on more than one occasion during the long trudge up the glacier and it wasn’t until the sun rose giving us a view of the surrounding mountains that the adrenaline kicked in and we began to wake up properly. 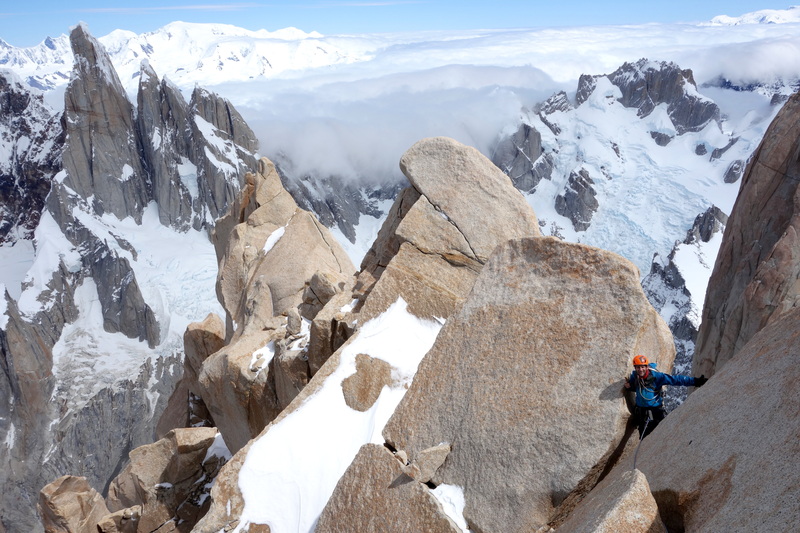 Our objective was the Aguja de Poincenot, a beautiful needle of granite which along with its neighbour Cerro Fitzroy is one of the most striking peaks in the Massif. 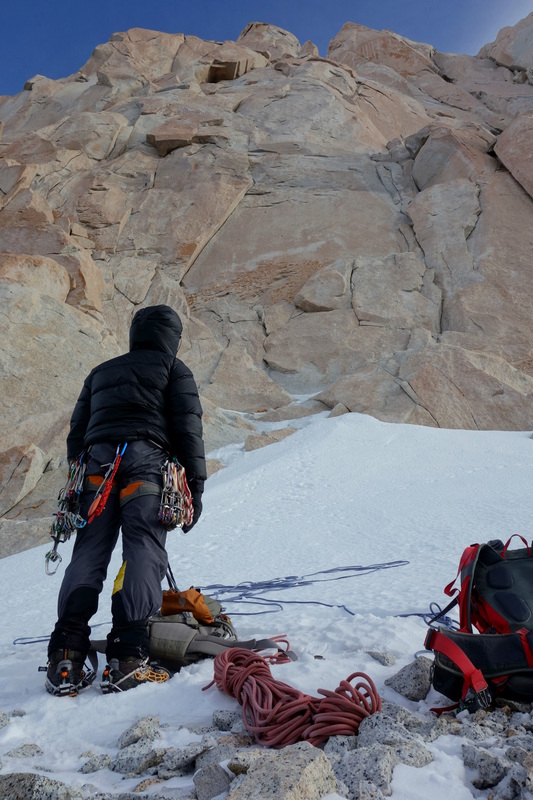 We reached the base of the mountain around 7:30am – well behind schedule due to our slow approach – so we decided to simul-climb as much of the route as possible to make up some time. 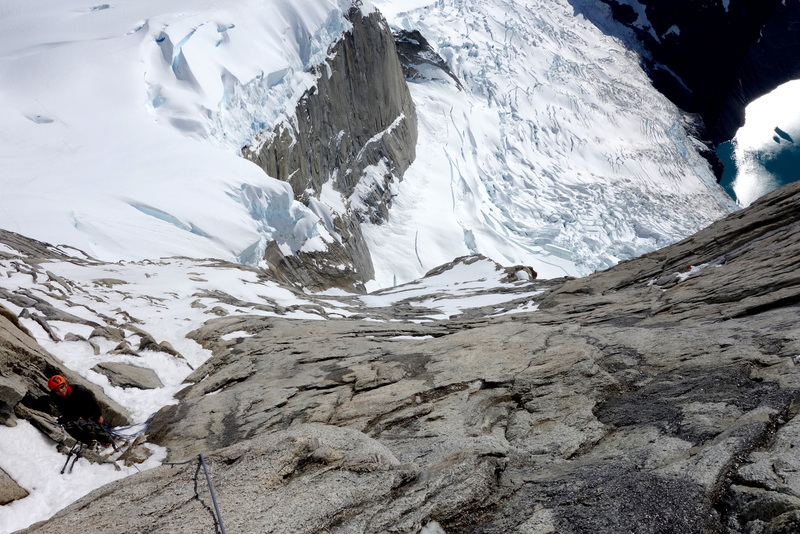 Simul-climbing is where both climbers ascend simultaneously – roped to one another – and requires huge trust in each other as falling could have dire consequences. 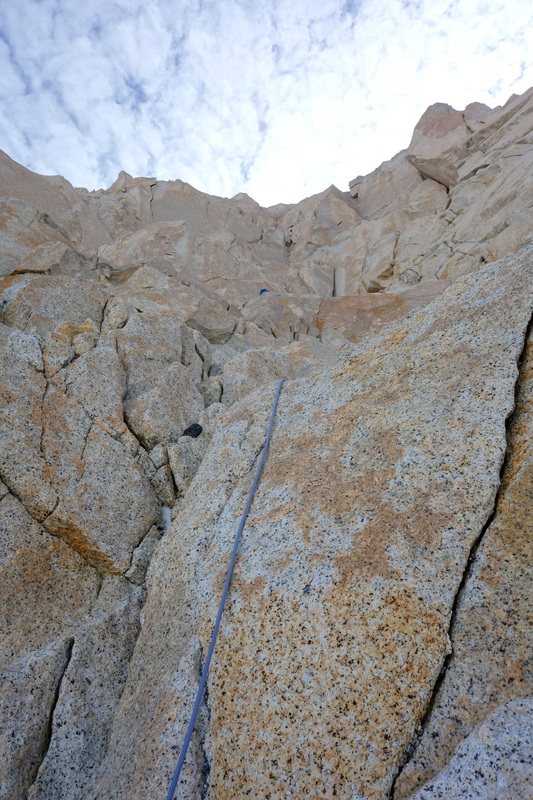 I wouldn’t have simul-climbed this route with anyone but Wilki. 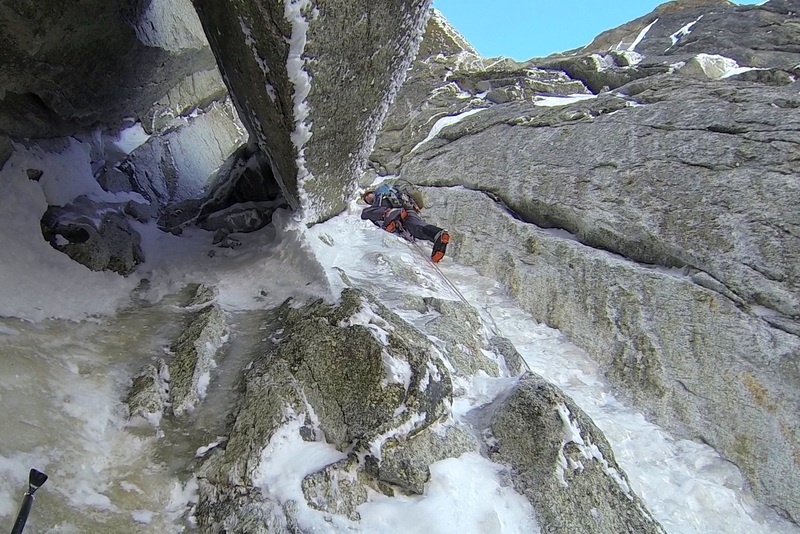 Halfway up the mountain the ice feature that we were climbing narrowed and steepened into an overhanging chimney which gave us 50 metres of exciting and fun mixed climbing, requiring us to use our ice axes to hook and torque into the rock cracks where no ice was present. 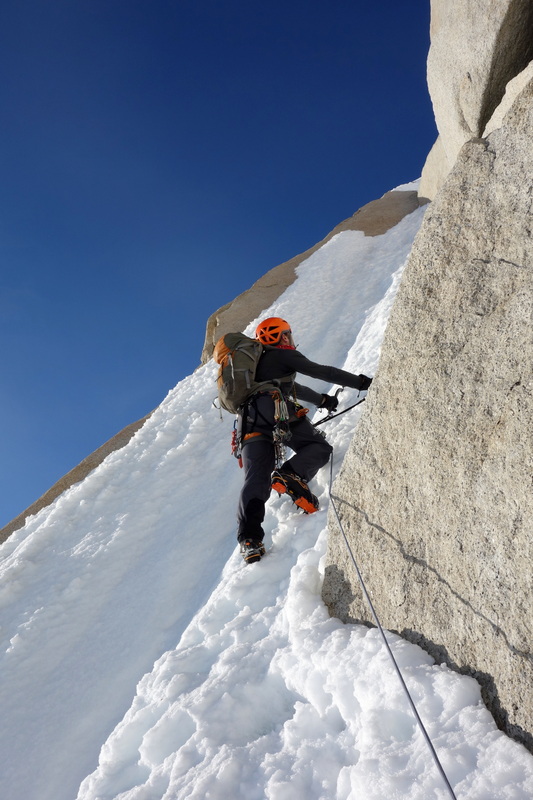 The second half of the mountain was largely free from snow and ice so we cached our big mountain boots and crampons allowing us to climb with much more precision in our rock boots. 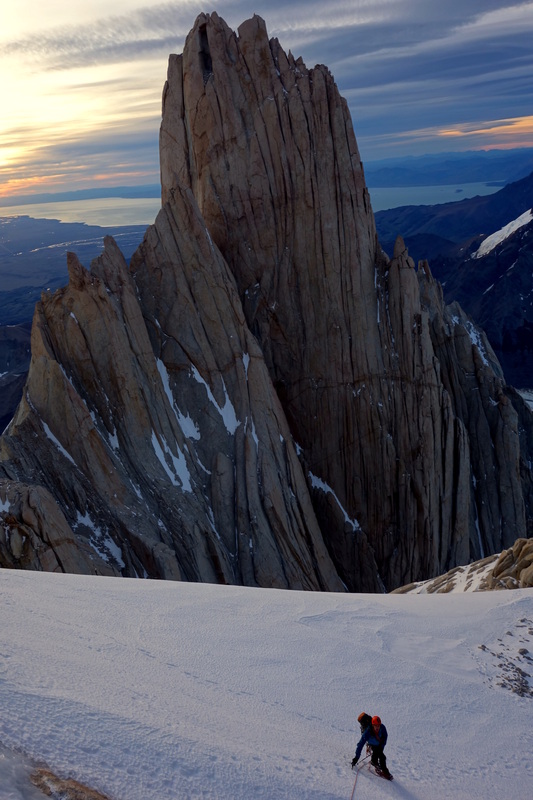 Once again we simul-climbed; weaving our way up through the headwall of immaculate granite for a few hours until we finally hit the summit ridge with a blast of Patagonian wind in our faces and a spectacular 360° view of the whole mountain range. 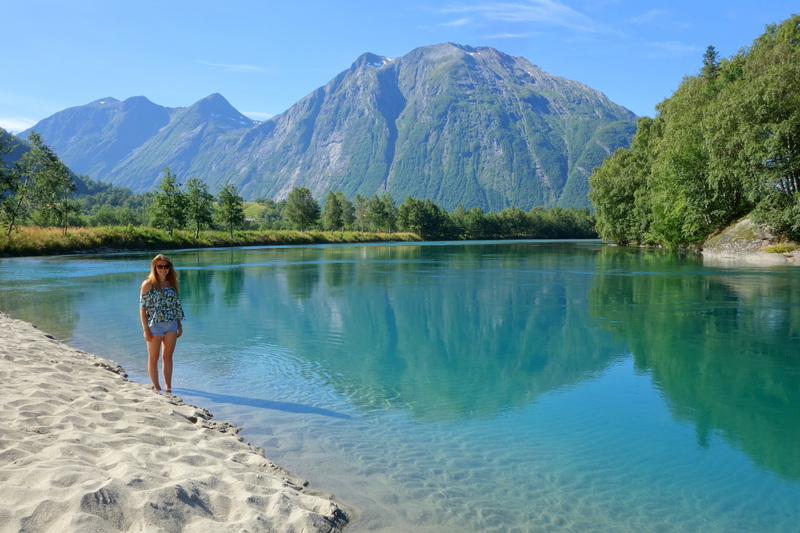 It was hard to believe that we’d only arrived 20 hours earlier! 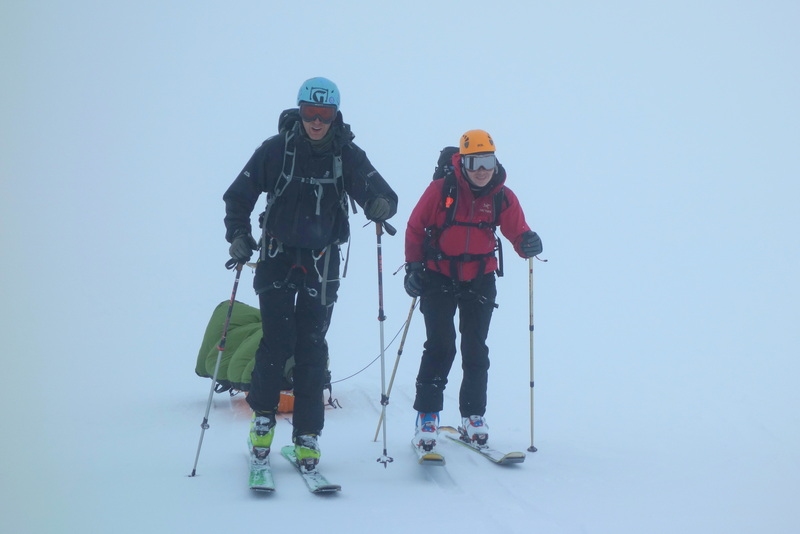 We descended the mountain in about 4 hours, abseiling every inch until we reached the bergschrund, and after an irksome trudge down the glacier in very poor snow conditions we finally made it back to the tent at 8pm. Success! 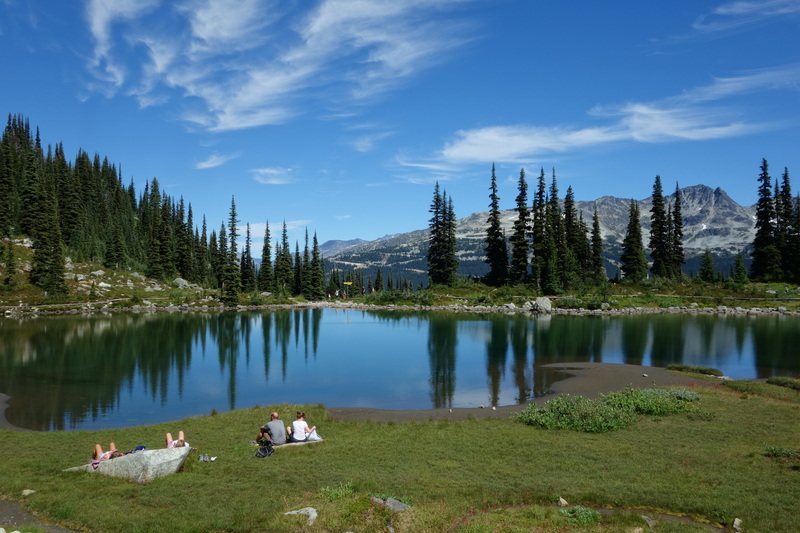 2 days later – to our amazement – the forecast showed another weather window was on the way, so we packed up once again and headed for the mountains. 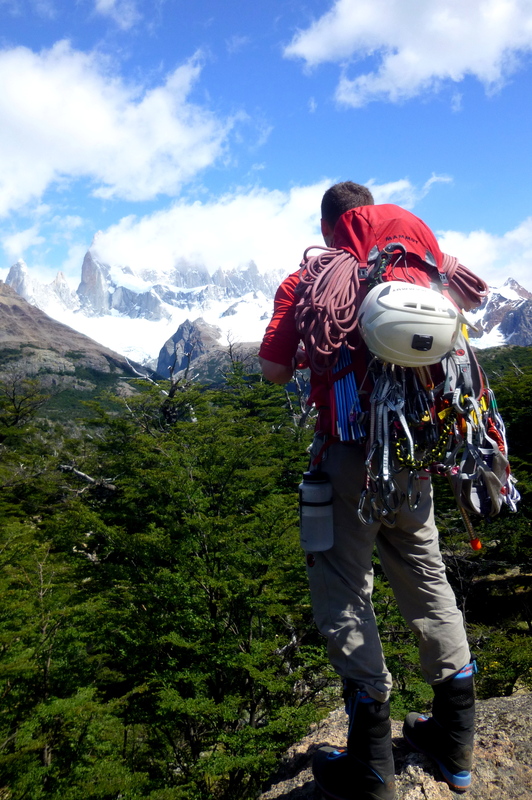 This time our aim was to climb the highest peak in the area, the legendary Cerro Fitzroy. We could see on the long hike in that the mountain was being rattled by ferocious winds; the clouds that usually cling to the walls were dancing at high-speed, forming and dissolving in a continuous cycle. 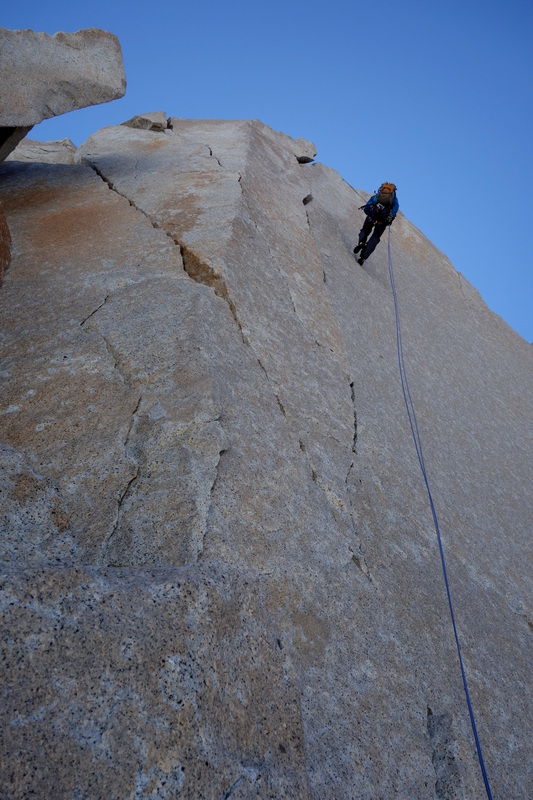 It didn’t look good, but we still had 12 hours for the winds to calm before we would be climbing those walls. 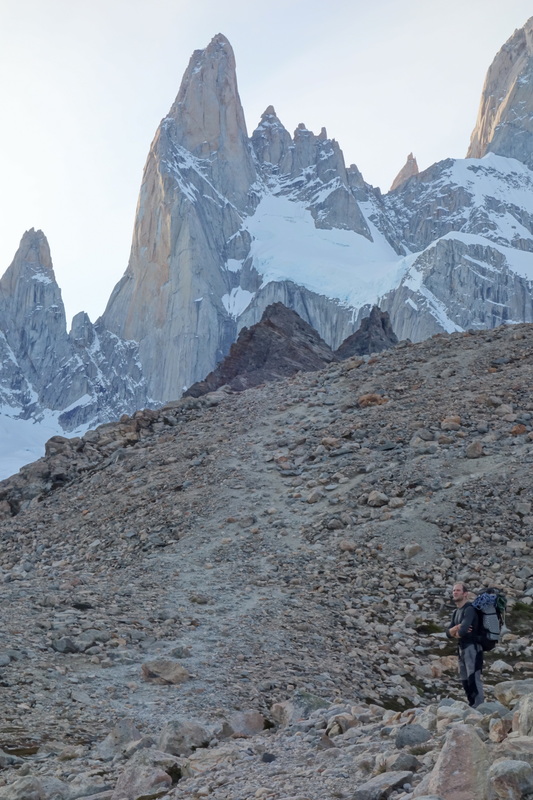 We camped up on the glacier, perched on a ridge with views for miles in every direction; the flat pampas to the east and the mountains to the west, it was utterly beautiful. We left our camp at 2am under the starriest night sky I have ever seen, and without a trace of a wind. 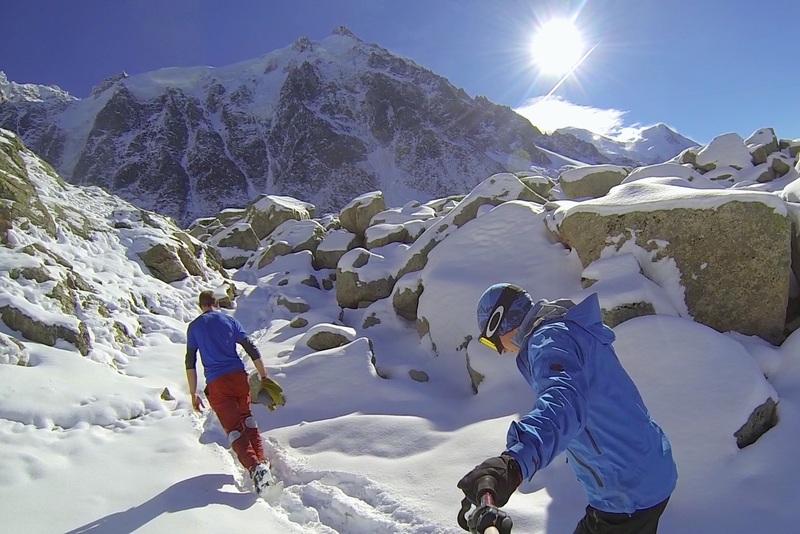 The snow conditions were excellent and we felt fit and well rested. 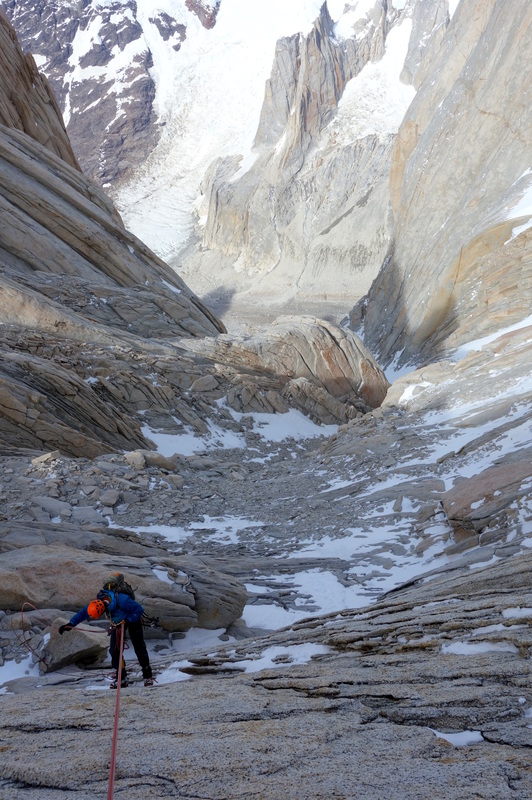 The hike up to the top of the glacier took us just one hour (it took us nearly 3 hours on our previous Poincenot mission) and from there we set off climbing up the steep slopes that form the lower flanks of Cerro Fitzroy. 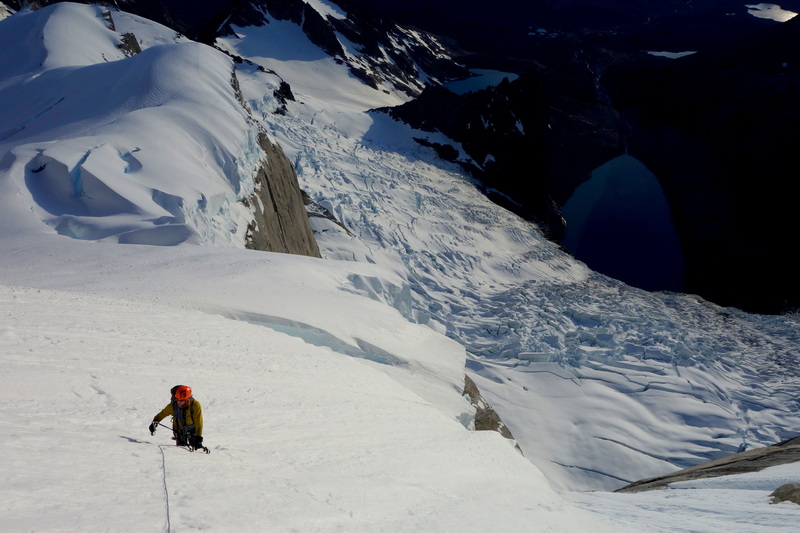 Over the next 4 hours we covered a lot of very varied terrain; a never ending ice slope, a precarious rocky ridge, an exposed hanging ramp, and finally a section of mixed climbing to access a snow patch at the base of the Fitzroy headwall. 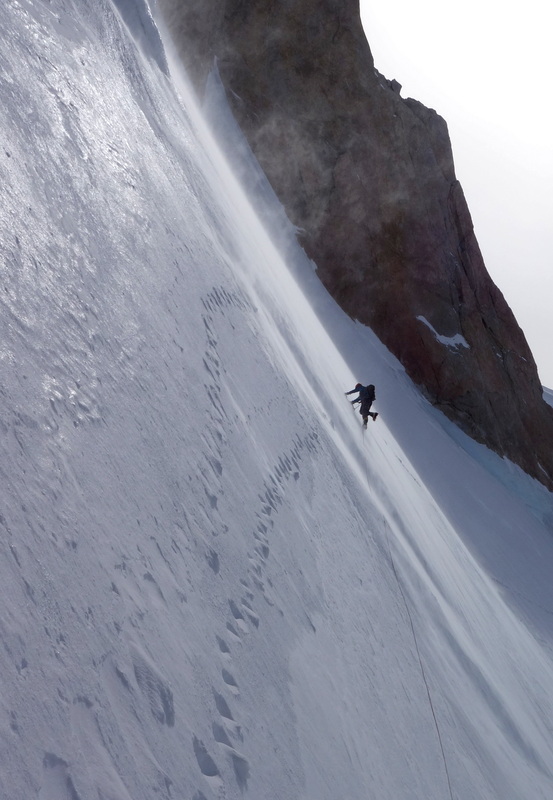 The wind first made an appearance when we hit the rocky ridge and by the time we reached the base of the headwall it had intensified to the point of being a real concern. 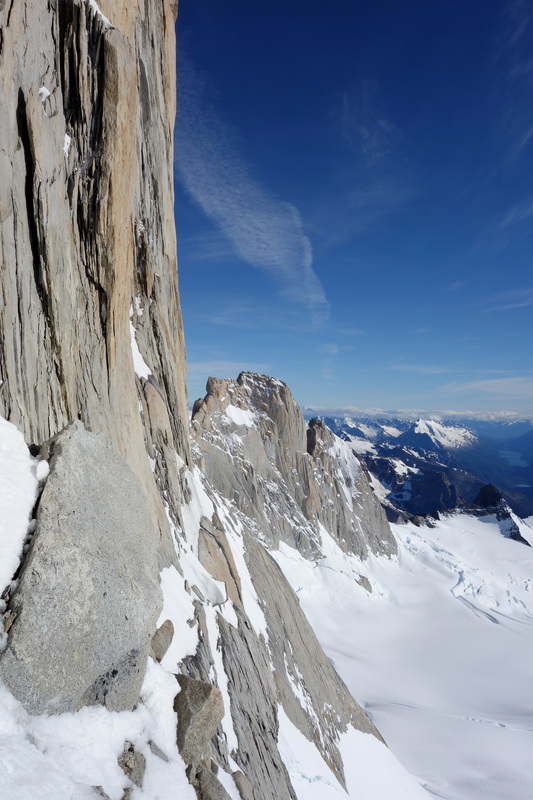 Above us loomed 400m of vertical granite, the likes of which would require exposed hands and, ideally, thin rock boots in order to ascend. Every 30 seconds or so a snow devil would engulf us and force us to retreat into our down jackets. This was not ideal! 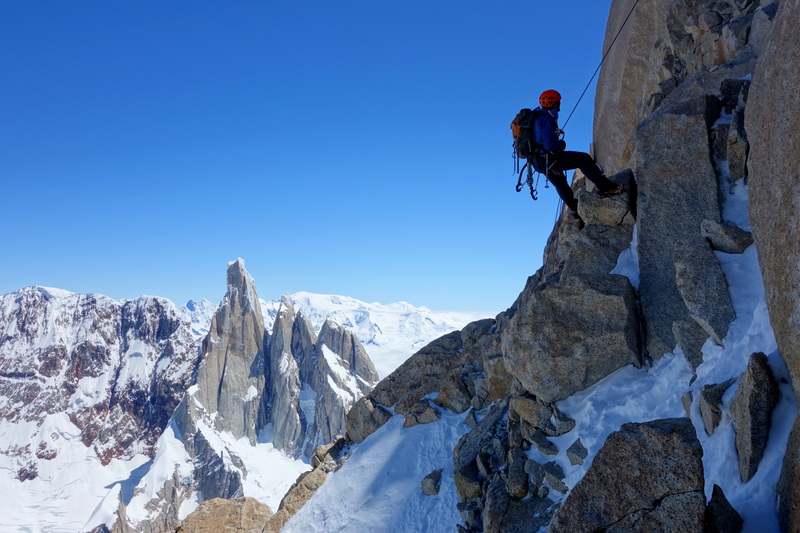 We set up a belay on a flattish rock ledge where Wilki – having drawn the short straw – changed into his rock boots and racked up for some technical climbing. I watched, pityingly, as he climbed up away from me. 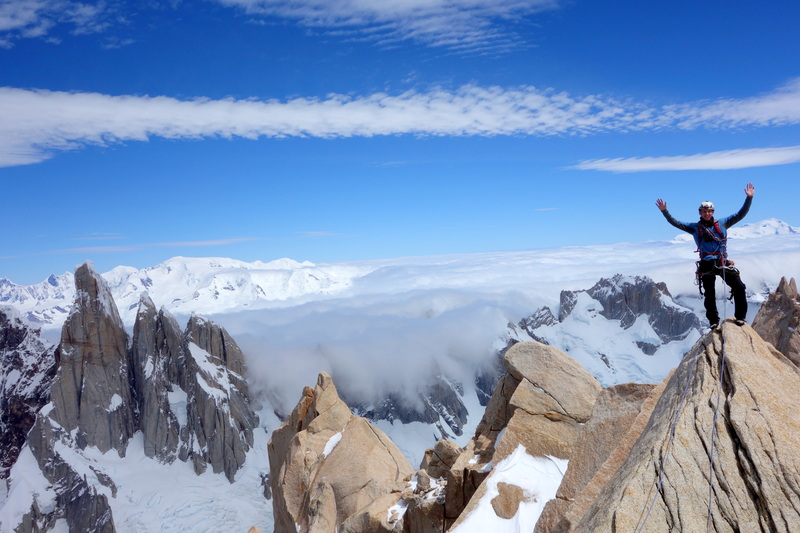 I was freezing cold, and I was wrapped up in my down jacket, with thick gloves and big mountain boots; I couldn’t imagine how he must have been feeling. 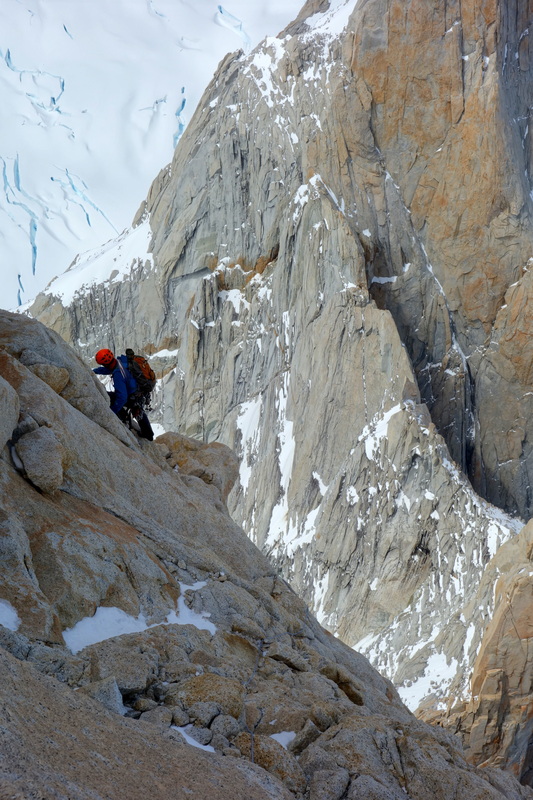 I could see from the way that he was climbing that Wilki was losing the use of his hands; they looked stiff and awkward and the climbing was slow as he frequently had to stop to shelter from snow devils which whipped around him savagely. Over the roar of the wind we shouted to each other and decided it’d be best to lower back down to the snow patch and warm up; from there we could take stock of our situation. Back down on the snow slope Wilki got warmed up again and we discussed our options. With the sun now properly risen we had a good view of the mountain range and could see lenticular clouds forming in all directions around us; these are an indicator of very strong winds and suggested to us that the conditions weren’t likely to change anytime soon. We rationalised that we could battle on up, but it would be miserable and potentially very dangerous, so really the only sensible option was to retreat back down to safety. 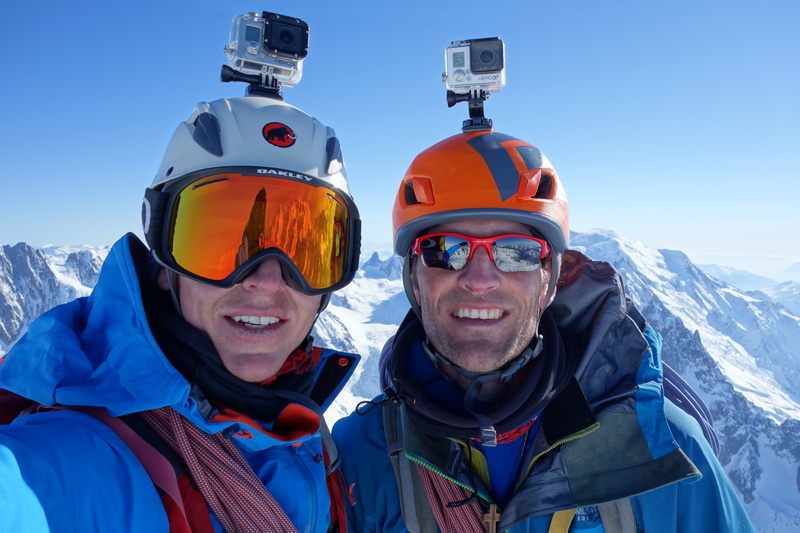 4 years ago – before I met Wilki – I probably would have opted to keep on fighting through the fierce winds to reach the summit; I’d like to think that our decision to back off on this occasion is testament to the fact that we have nothing to prove to anyone, least of all ourselves, and is the product of 4 years of invaluable mountain experience. Or maybe it was just that we really didn’t want to freeze our asses off! Retreating back down the line we’d just climbed gave us a fantastic opportunity to properly take in the phenomenal geology that surrounded us which we’d only been vaguely aware of on our ascent in the darkness. 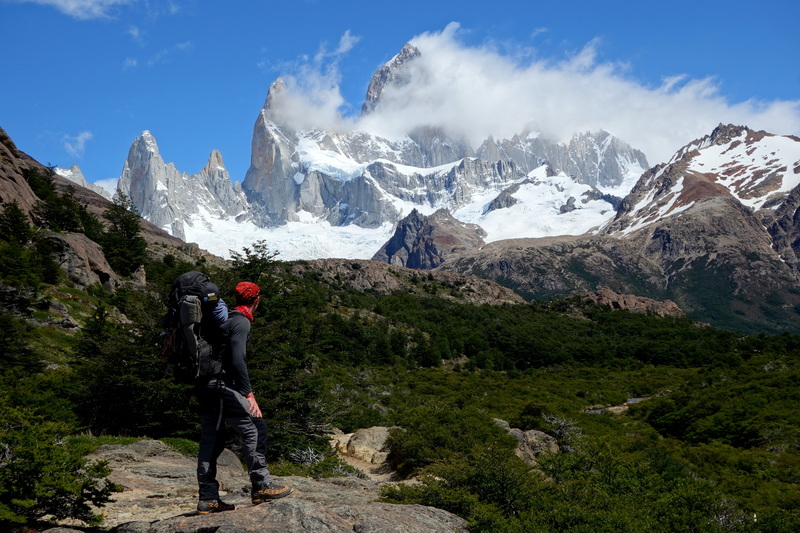 The Fitzroy mountain range truly is one of the natural wonders of the world and we were both chuffed to bits to have had the opportunity – over just 6 days – to get out not once but twice and experience it in all its glory. Wilki buddy. It’s been awesome! Here are some happy memories from 4 awesome years packed full of adventure. 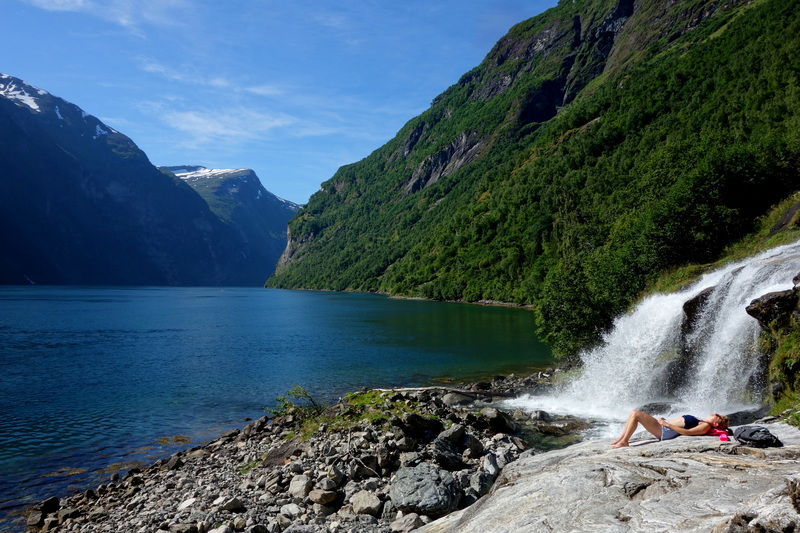 Until recently, when I’ve pondered over the best trips that I’ve ever been on, I’ve tended to pick out those that were most challenging or those that carry with them the most accolade. Nowadays though, I appreciate that challenge and accolade are not necessary to make a trip. 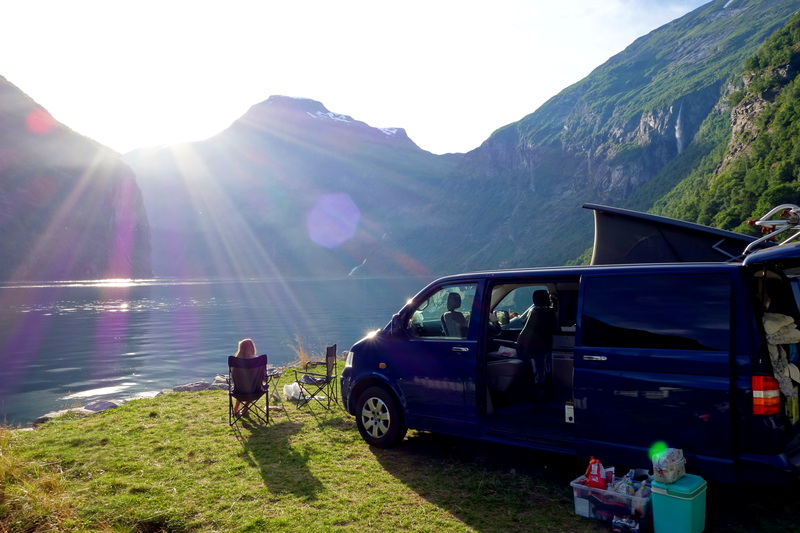 This summer, Lucy and I drove from our home here in Shropshire up to Norway; visiting friends, seeing the beautiful sights and enjoying each other’s company for a month on the road. 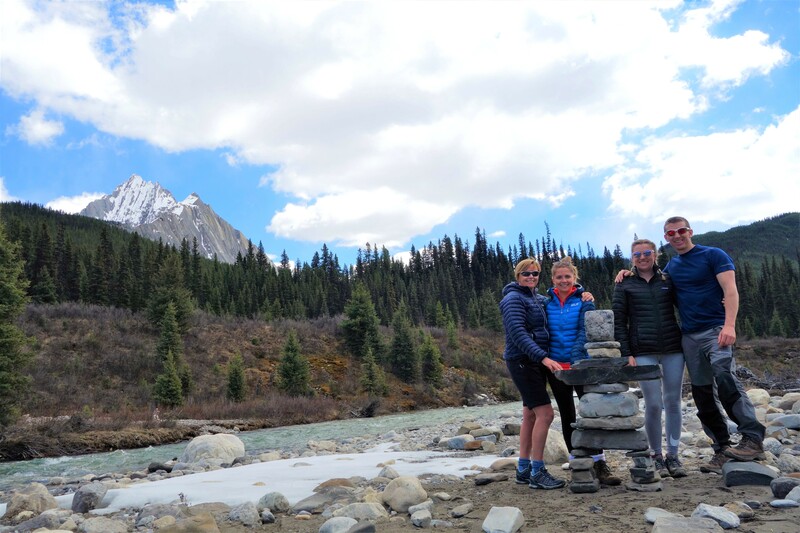 It was without a doubt one of the absolute best adventures I have ever had, and has reinforced my new approach to planning trips around having fun ‘In the moment’ rather than only in hindsight! Here’s a short film of our road trip and a few photos from our favourite locations. It’s been a few months now since I returned from my last trip to the mountains and I’m still digesting all the events that took place. Ultimately, we failed to achieve what we set out to do. But was the trip a failure? That is a very subjective question. 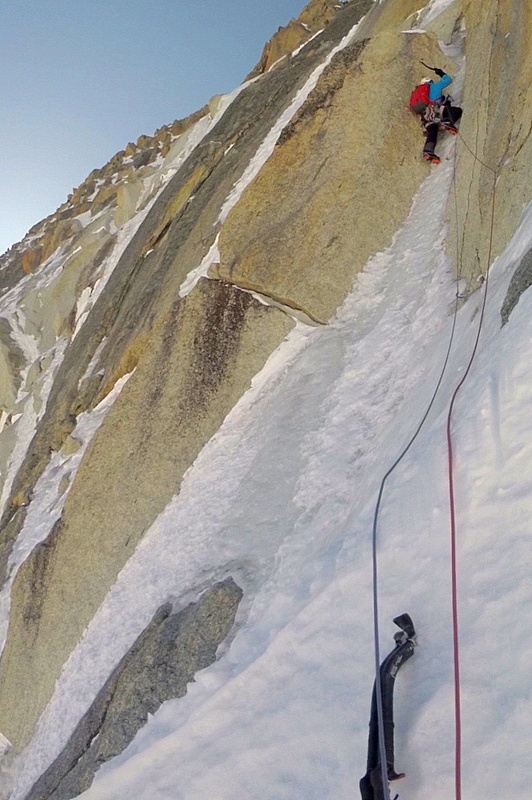 Back in October 2014 Wilki and I launched our speedwings from the top of the Aiguille du Midi’s North Face having made a swift ascent of a TD mixed route up the iconic dark wall of ice and rock. 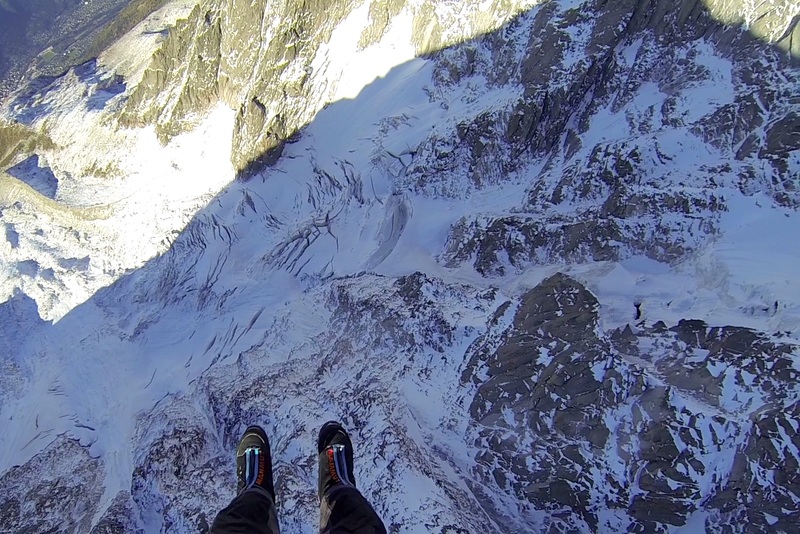 The flight down got us back to Chamonix less than ten minutes after leaving the summit ridge. 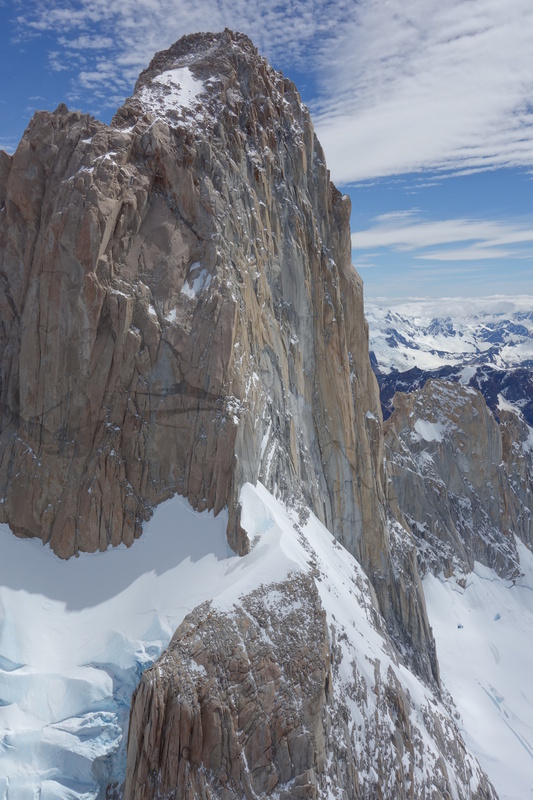 During the flight- whilst descending at a rate of 1200ft every minute- my mind was racing as I considered more serious routes that could become our next ‘speedwing alpinism’ objective. 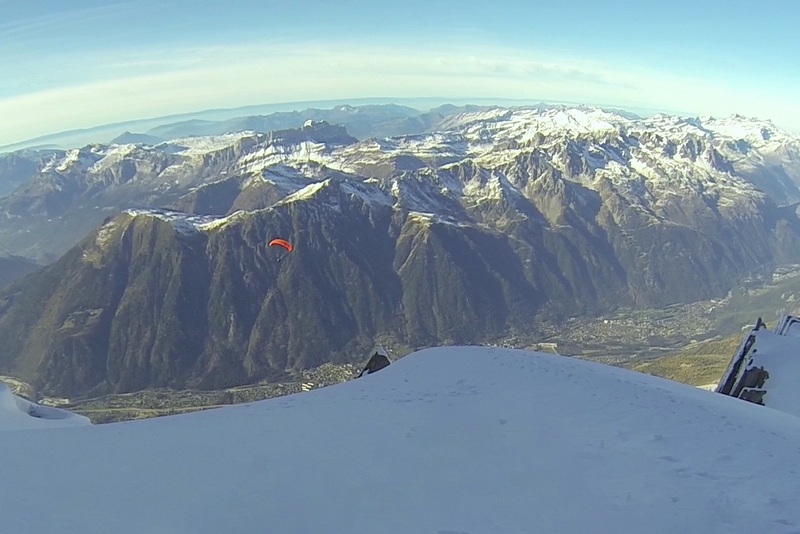 This last March we returned to the Alps to take the concept to the next level with two main aims: firstly, we wanted to fly off the top of more technical routes, in the ED range; and secondly we wanted to use the wings to cover more ground than we could possibly manage on foot; flying from the summit of one mountain to the base of another, and then climbing a second route before flying off its summit. 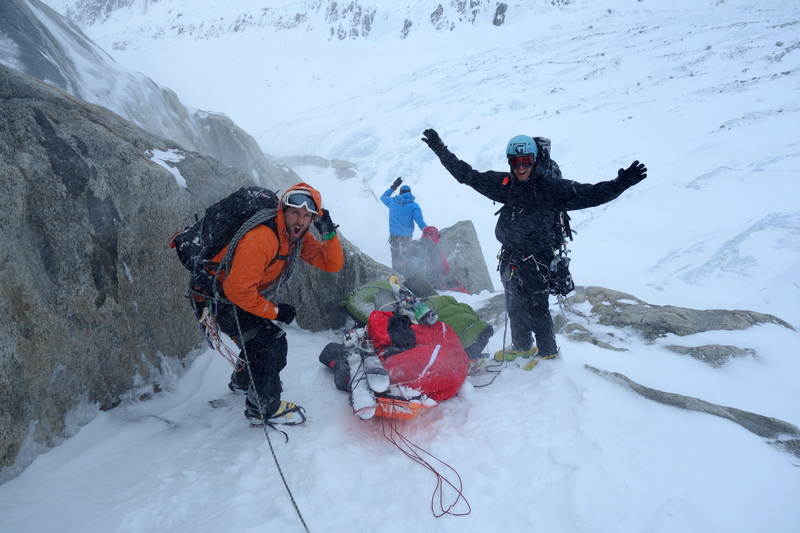 Wilki and I were joined on the trip by my brother Niall and Murray Smith (Muzz) who would be climbing as a pair; and climber/film maker Dan Habershon-Butcher and his incredibly capable partner Nida. 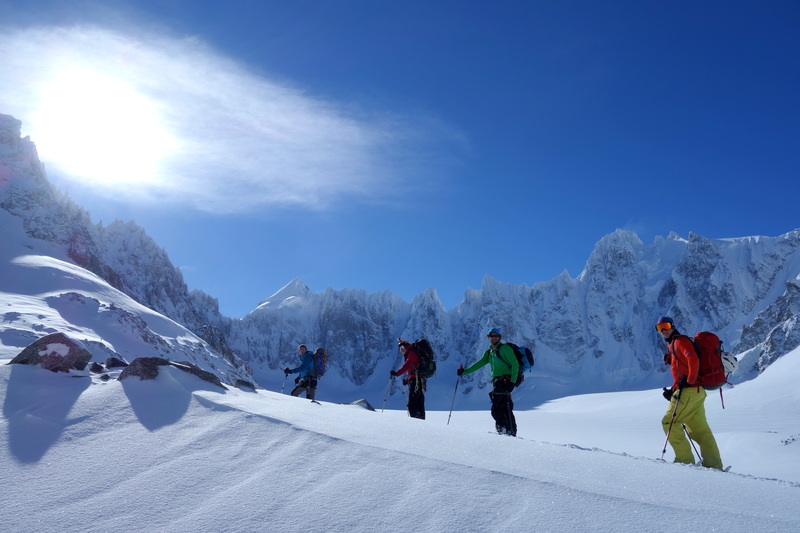 Together we hauled sledges heavily laden with all our climbing, flying, skiing and filming equipment up the Argentiere Glacier to the refuge situated halfway along the valley. 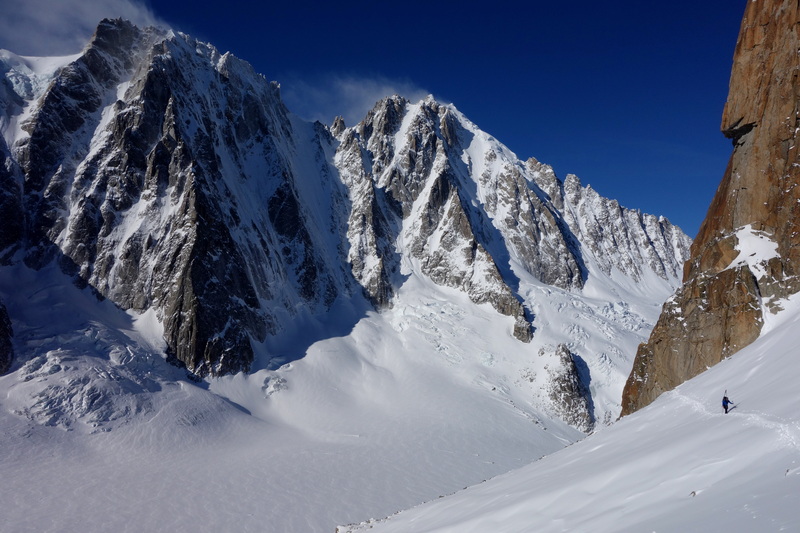 From there we were well positioned to access the steep north faces of the Verte, the Droites, the Courtes, the Triolet and various other lesser peaks, as well as the southern slopes of the Chardonet and the Argentiere. 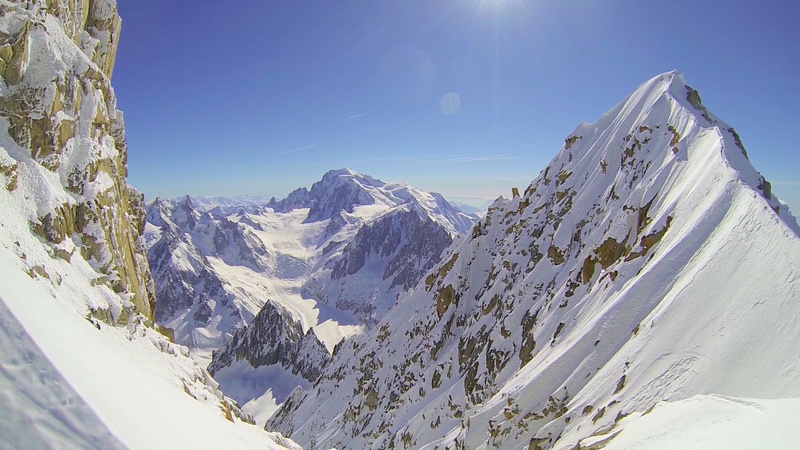 My idea in basing ourselves here rather than down in Chamonix was that we would be much better positioned to make the most of any short weather windows that we were offered, even a window as short as an hour would give us enough time to get out for a ski and short flight. Each evening in the hut we eagerly awaited the arrival of a new weather forecast and each evening we would sit- slightly deflated but always upbeat- rearranging our plans to try and make the most of what we were being dealt. By and large the weather was by no means awful; it just wasn’t conducive to ‘speedwing alpinism’, or any climbing for that matter. 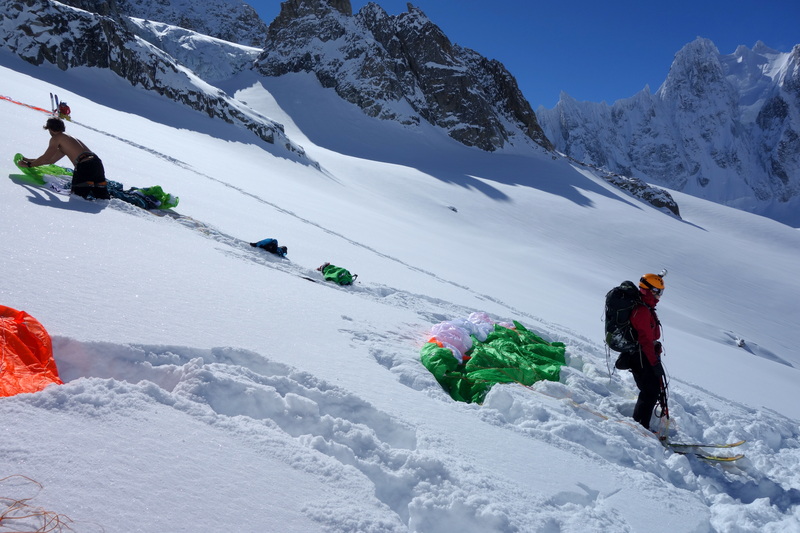 The few parties that did venture out to attempt climbs invariably came back disappointed, and one or two narrowly avoided disaster when they got caught in avalanches. 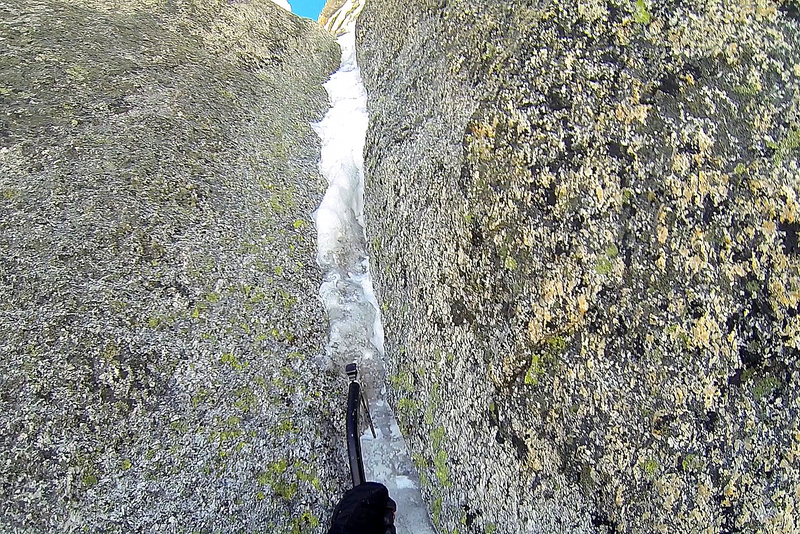 Impatience can be lethal in the mountains. 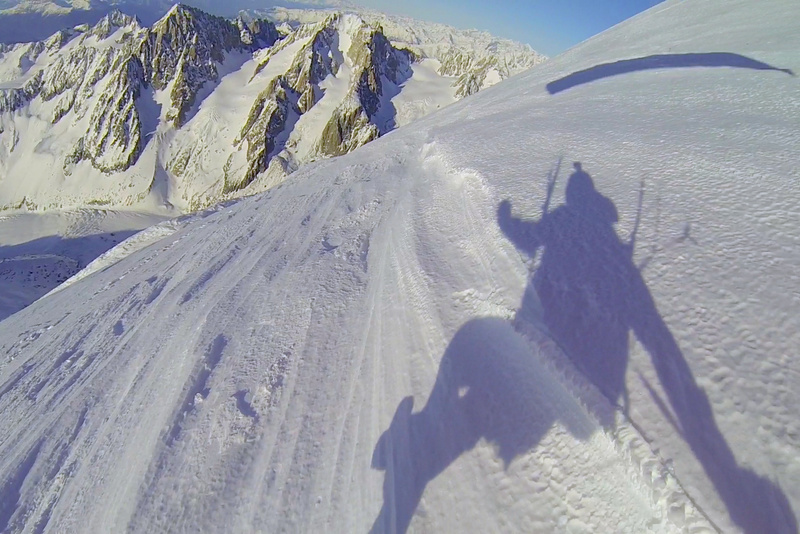 We kept ourselves busy from day to day with some fun skiing and a few flights down the valley’s south facing slopes. One of the highlights of the trip was watching Dan and Nida making their first ever speedwing flights, both were naturals. I remember being very aware of a number of different emotions vying for dominance within me; a responsible and caring side of my personality watched with great concern as each of them sped into the distance; overriding that, was a mischievous child lusting after a moment of schadenfreude, which in the end was delivered as Dan flew at high speed into a thick bank of fog. Our laughter would probably have just about been audible to him as his world turned totally white and he crashed into a drift of powder! As the days slipped away and our return date loomed ever closer my plans became progressively more and more ambitious as I rearranged and expanded missions to fit all of my main aims into the few days we had left. Eventually, still empty handed, it came down to the final day of the trip and our last chance to get something of serious magnitude ticked off. The weather finally seemed to be playing ball and we formulated an ambitious but achievable plan which, if we succeeded, would make all the weeks of waiting worthwhile. 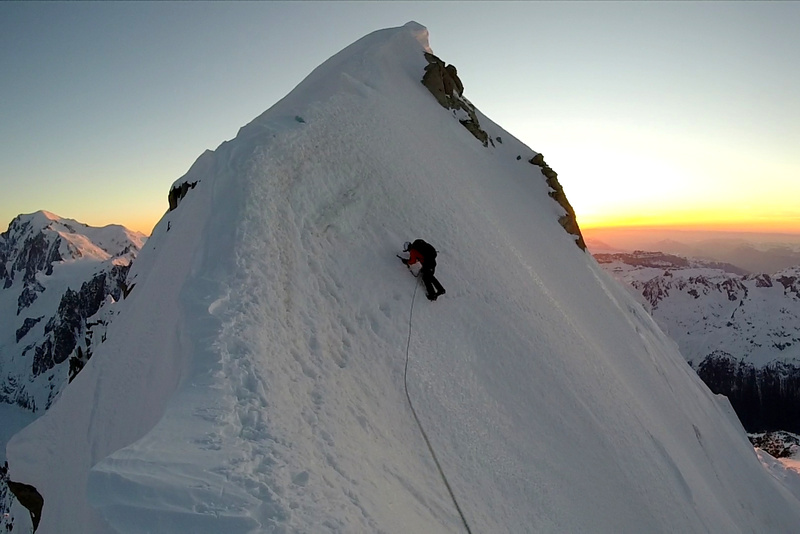 Wilki and I were going to climb ‘Late to say I’m sorry’ on the North Face of the Grand Rocheuse- an ED route- then fly off the summit of the neighbouring Aiguille Verte to the base of the Courtes where we would then ascend its North Face via the Swiss route. 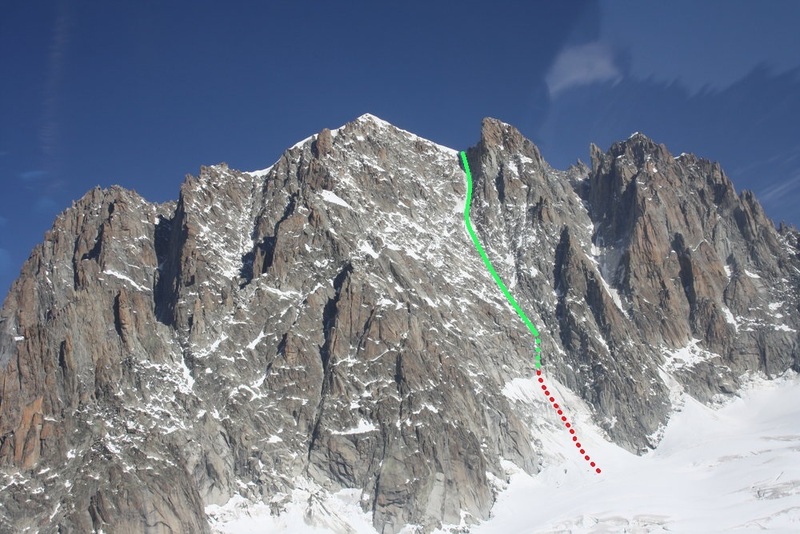 Niall and Muzz meanwhile were going to climb the Couturier Couloir to the summit of the Verte and attempt to launch from the same spot as us. 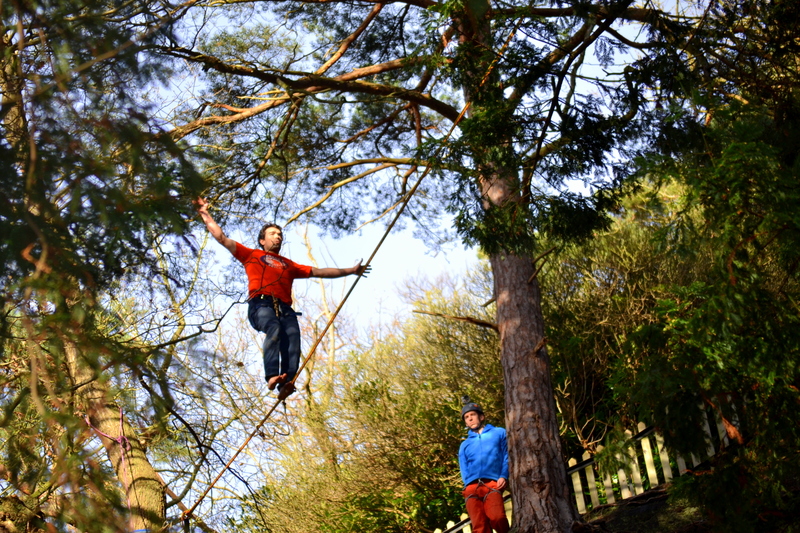 Dan and Nida very kindly volunteered to film from the valley bottom. 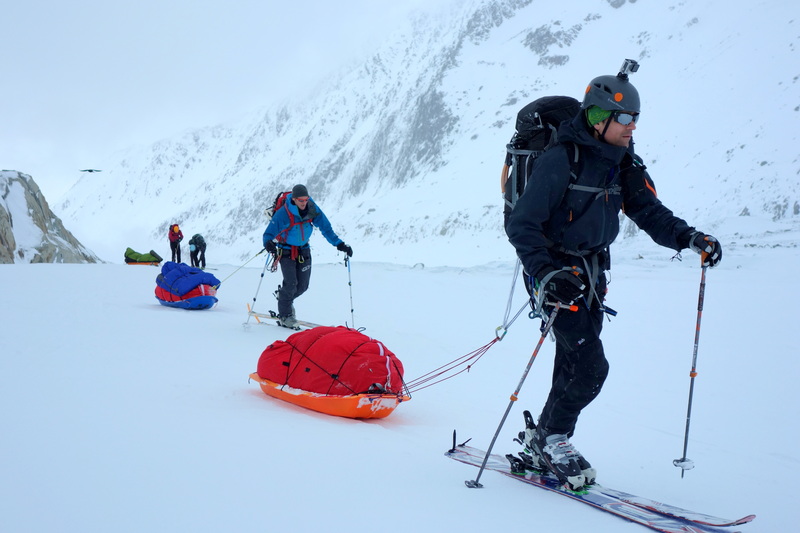 At 2am Niall, Muzz, Wilki and I set off skiing across the glacier to a spot where we left our skis and took only what we’d need on the climb. From here we wished each other the best of luck and set off separately, Wilki and I feeling very aware that we needed to be moving fast to remain on schedule. I remember feeling an intense pang of emotion as we parted ways knowing that if anything happened to my brother there’d be nothing that I could do. 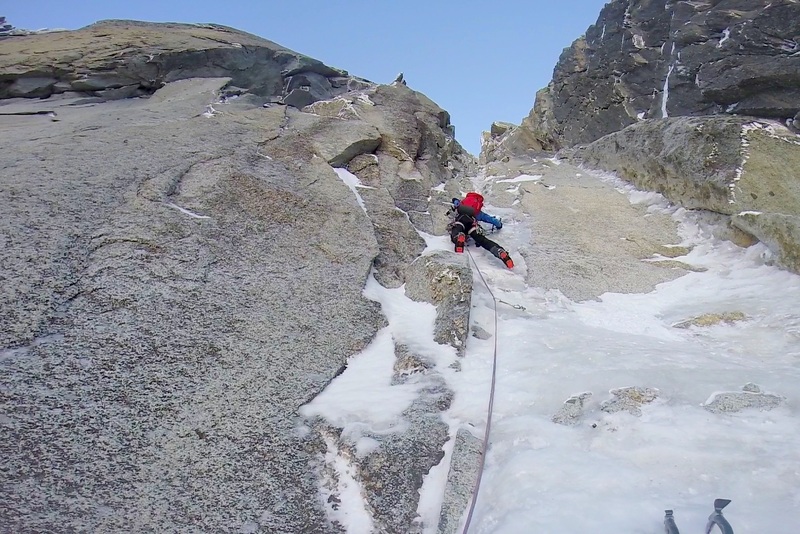 Wilki and I moved fast as we simul-climbed up the lower ice fields. For hours on end the sound of my own heavy breathing and the small circle of torch light in front of me were the extent of my awareness. 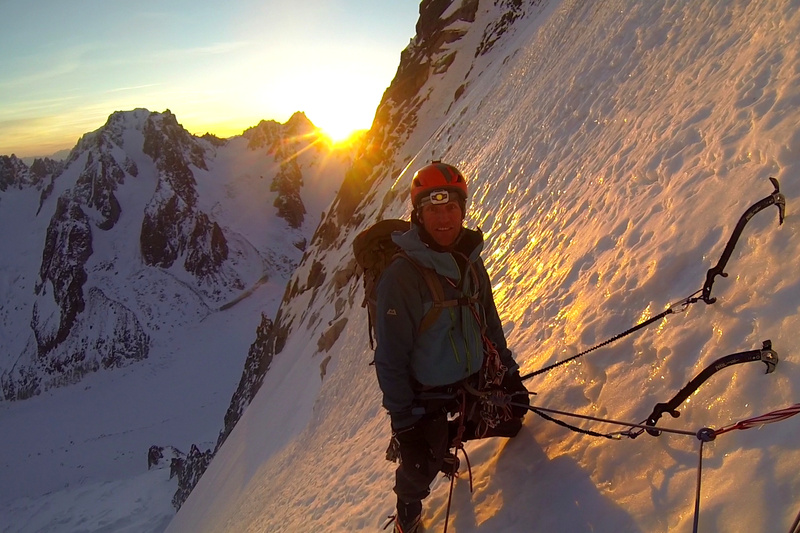 We reached the bottom of the real difficulties just after the sun hit the face and a beautiful pink alpenglow dripped down the wall to our stance. 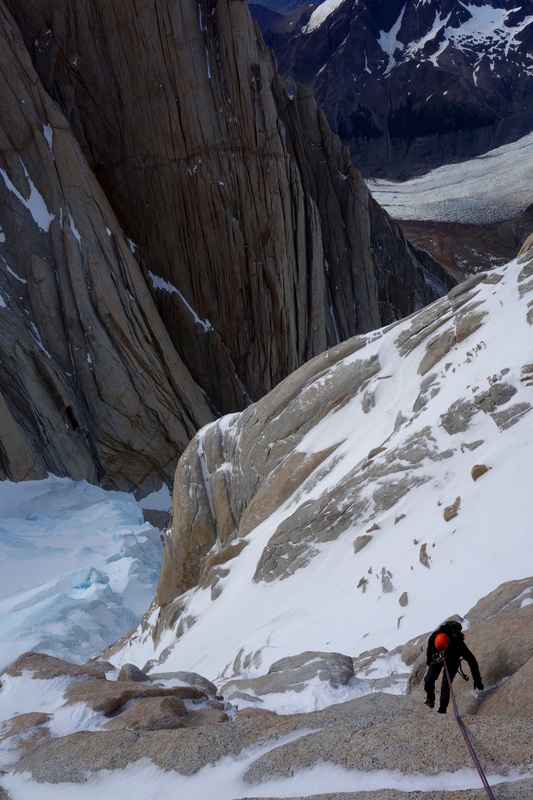 From here we could see the majority of our route; an impossibly thin thread of ice weaving its way up through the vertical cliffs of the Grand Rocheuse. 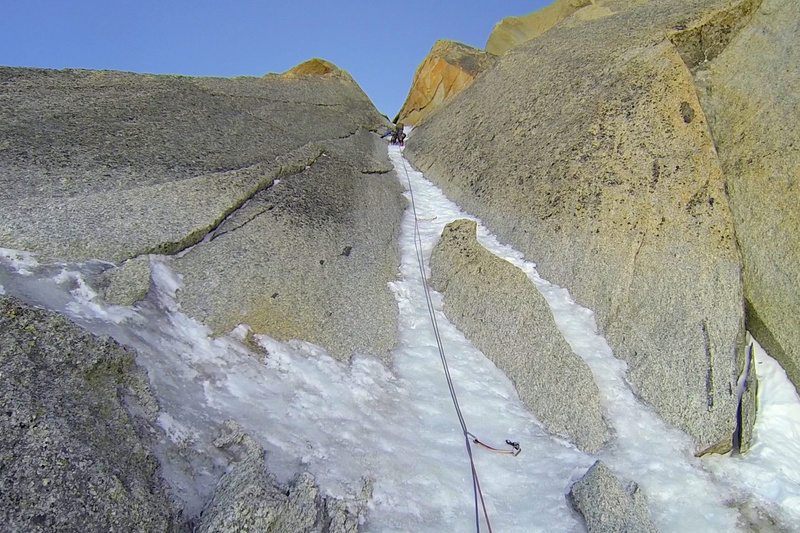 We climbed quickly and efficiently alternating leads up the relentlessly steep ice and rock with only one moment of serious drama when the 6 inch wide ice feature I was climbing ripped off the rock taking me with it. 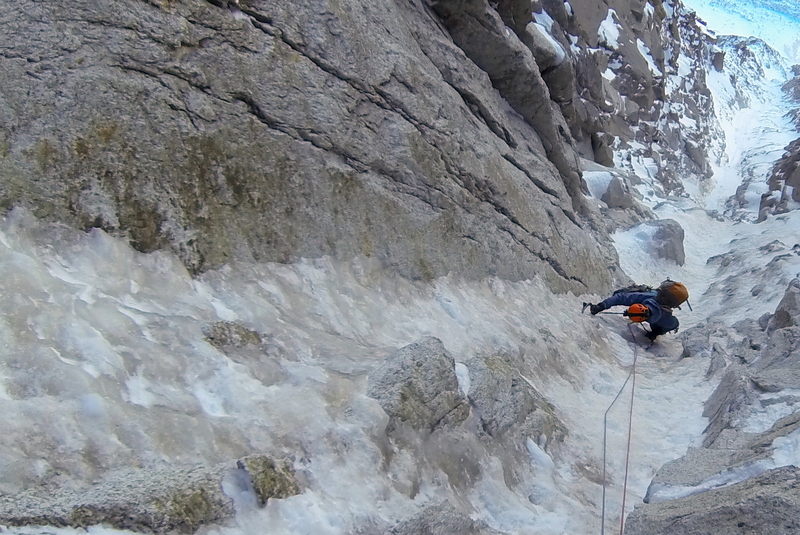 After falling 8 metres I was finally caught by a stubby ice screw that I had placed as an afterthought. 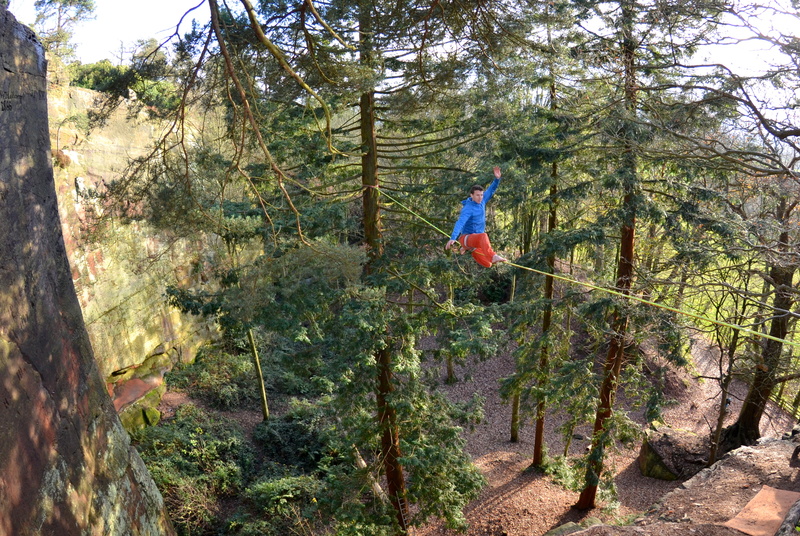 Had I not placed it the fall would have been closer to 30 metres. 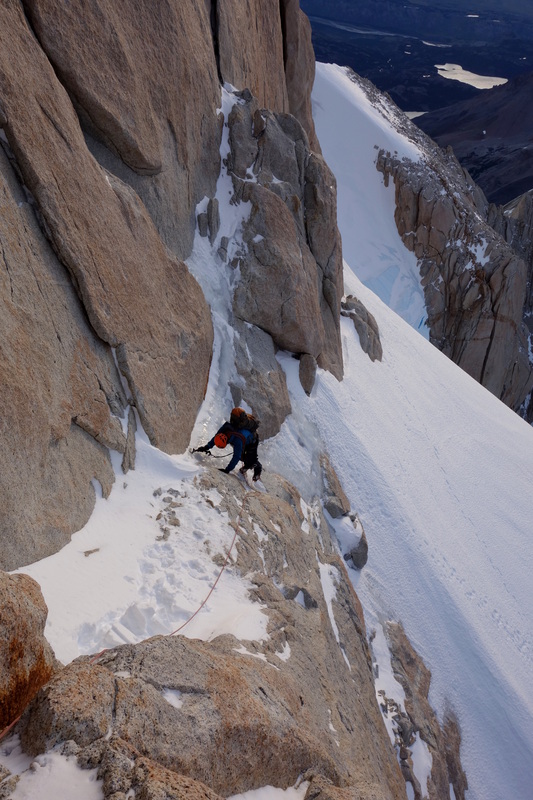 By early afternoon we were on easier ground and once again simul-climbing at a good albeit somewhat laboured pace as we were now above 4000m. Teetering along the knife edge summit ridge of the Aiguille Verte we had a good view of the Couturier Couloir which Niall and Muzz were climbing. Based on the speed they’d been climbing at earlier in the day we anticipated they would now be nearing the top of the route. 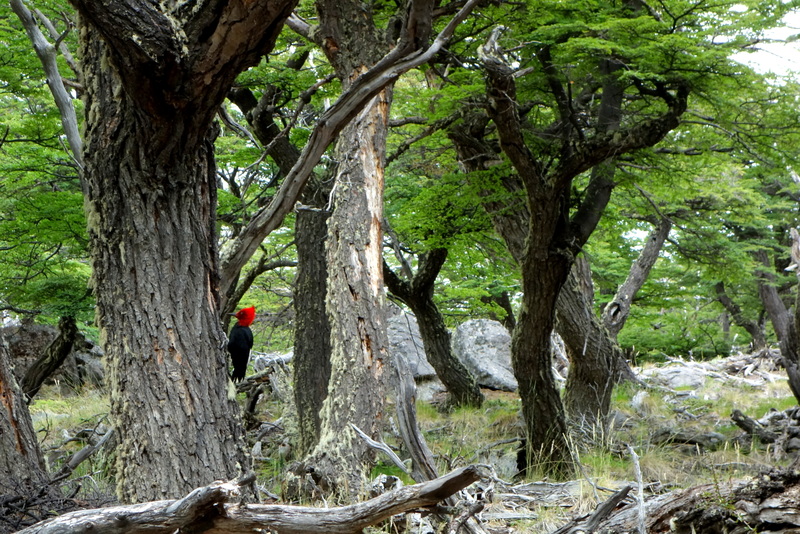 My heart rate noticeably sped up as we scanned the route and saw no sign of either of them. Had they retreated? 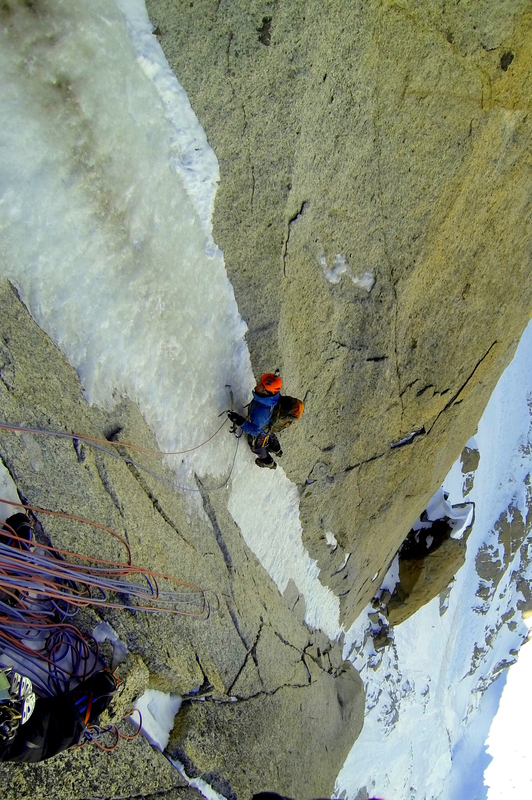 Had they been swept off the face by a serac fall? 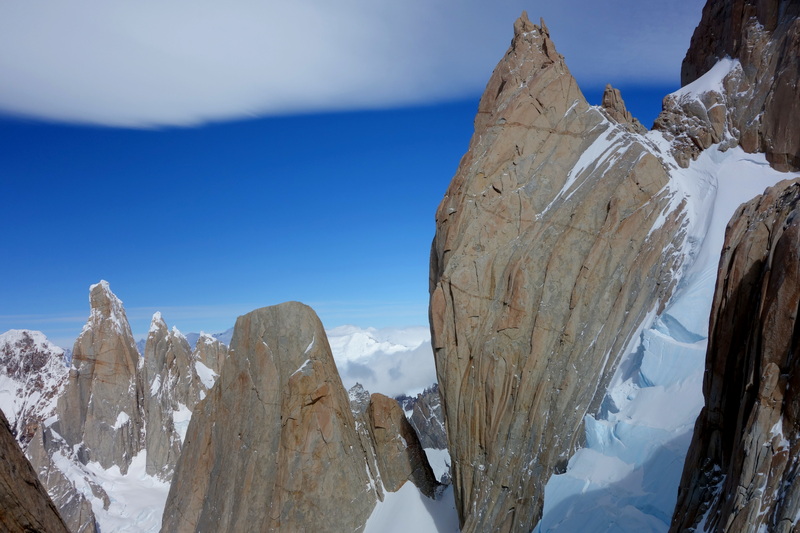 They certainly hadn’t topped out already as we could see that the summit was still pristine and untrodden. 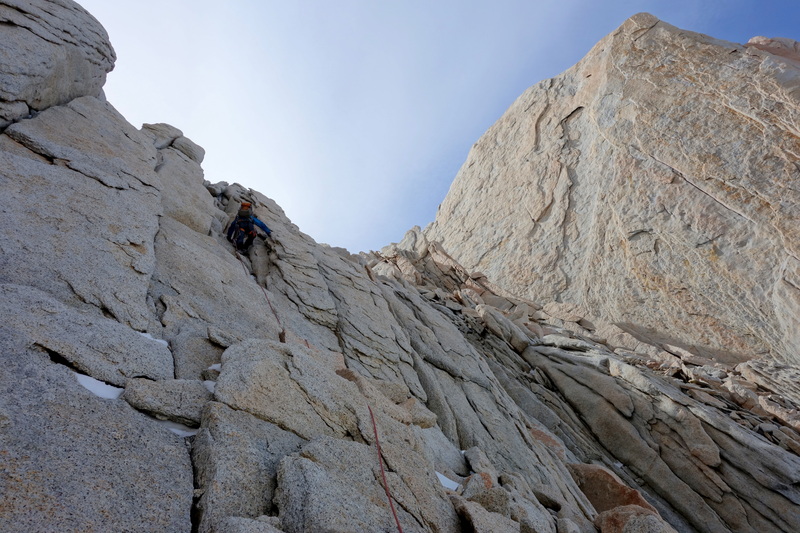 I tried to stop worrying about them and hoped that for whatever reason they’d made a safe retreat back down the couloir. 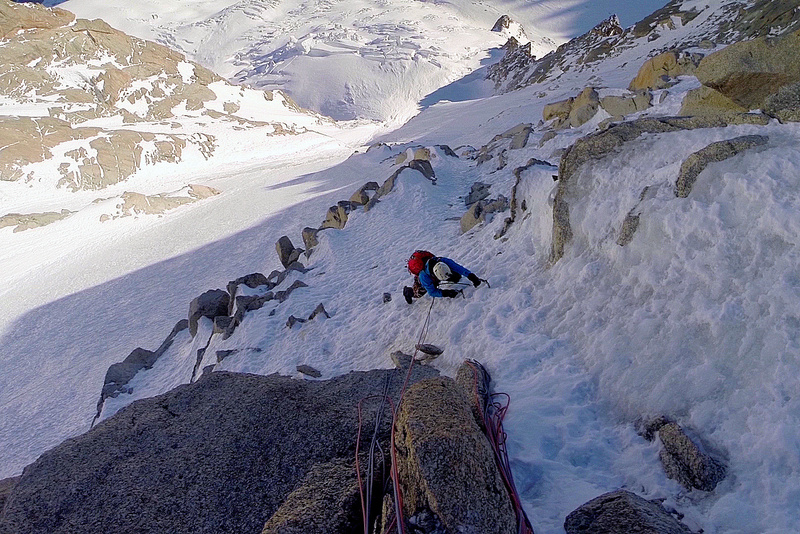 After no more than 5 minutes on the summit Wilki and I marched down the west ridge to our launch spot, but things weren’t right. The wind wasn’t coming from the northwest as had been forecast, it was coming from the northeast. This may not sound too bad but a 90° difference meant the wind was blowing across the launch slope rather than straight up it, on top of this it was very erratic; nearly non-existent at times but gusting up to 30-40km/h every 30 seconds or so. We decided to sit and wait for a few hours to observe the wind; noting any patterns and hoping that things would improve. They didn’t. 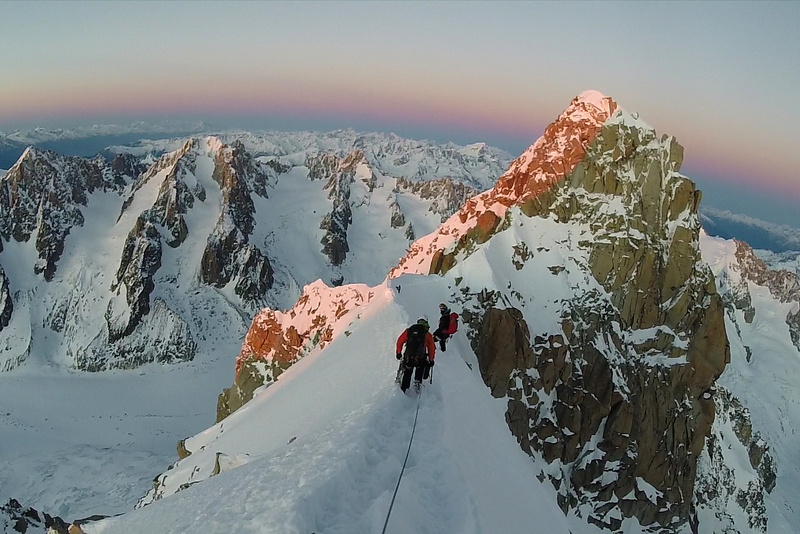 By now the idea of flying to the base of the Courtes was out of the question, we were just thinking about how we were going to get down at all. Eventually we decided to just give the launch a go. 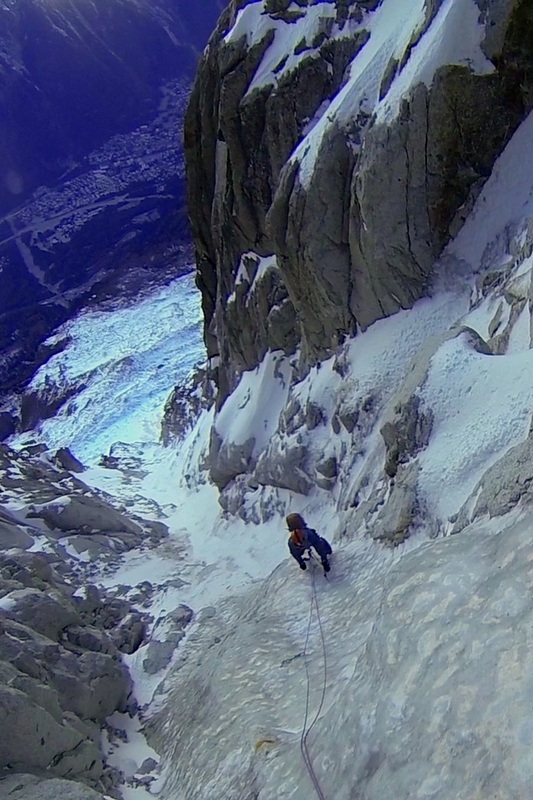 It felt strange untying from the ropes and packing them away for our take-offs; as a climbing partnership I’m used to having an umbilical cord between us, we are responsible for each other and make all our decisions together, with speedwing alpinism the second half of the mission is carried out solo, something I’m not used to. We stood separately, going through our own personal checks and tests, lost in our own thoughts. After a few minutes the silence was broken when Wilki spoke out, partly to me partly to himself. 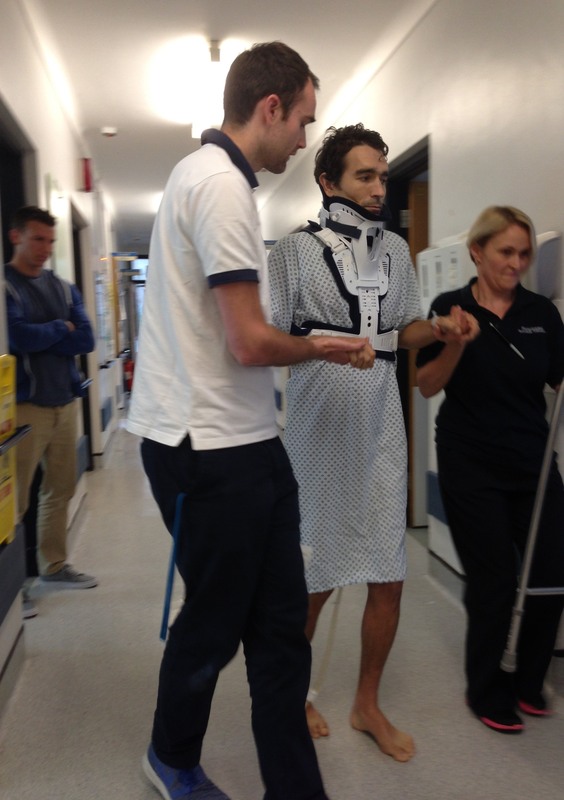 “I shouldn’t be doing this… I’m getting married in 3 months’ time… I shouldn’t be doing this”. They were the words that I desperately didn’t want to hear but had been anticipating for the past few hours. I wanted so badly to fly off the mountain. It wasn’t over yet though. 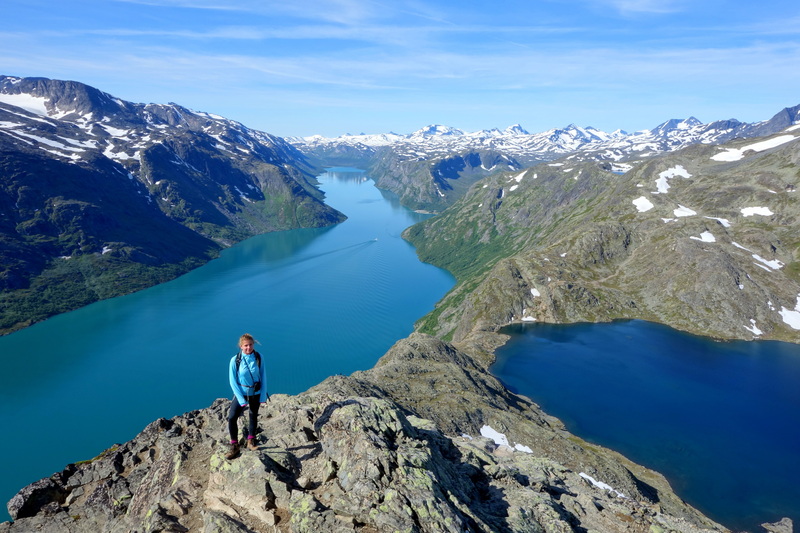 Wilki said that he was happy and confident to descend the mountain on foot by himself and he would do anything he could to help me launch. I asked him if he was sure he was OK with the plan and he assured me he was. I returned to my preparations and no more than 2 minutes later I was ready to go. Waiting for a lull in the wind my heart thumped against my chest like never before. The repercussions of a failed launch were terrible, I knew that, but I was confident that I could pull it off. The lull came and I made my move. As soon as the wing was up I was blasted by a powerful gust and thrown to the ground, I shouted out to try and reassure Wilki. 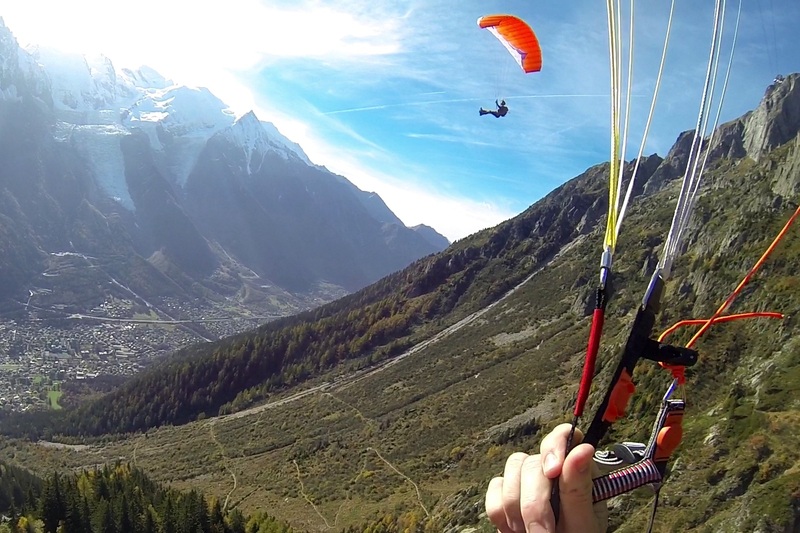 Slowly getting back to my feet I stabilised the wing, but just as I was ready to give it another go a second gust hit me, throwing the wing and me with it across and down the slope. I was no longer in any way in control and Wilki dived in to stop me getting dragged off the 1000m cliff I was heading for. Wilki’s words sounded strangely distant as we finally got the wing under control. I sat defeated and appalled at myself; appalled that I’d been prepared to take such a risk, to let my ambition rule my rationale. 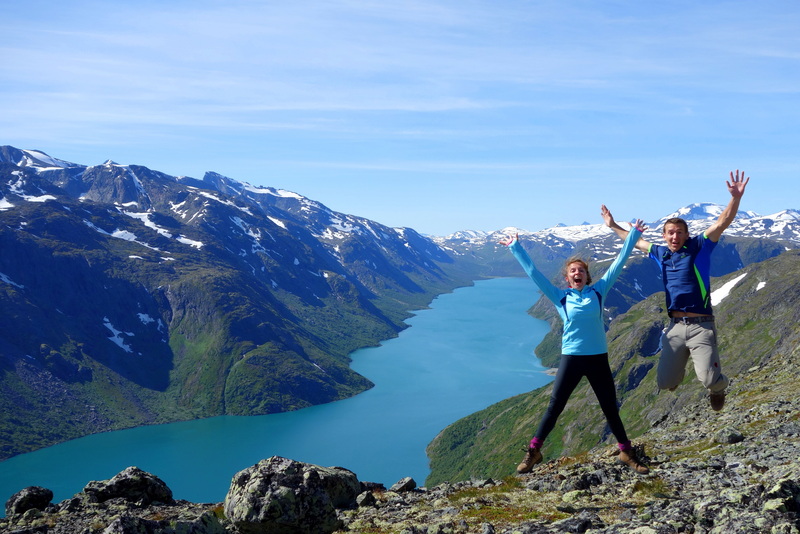 I’ve always prided myself as someone who makes sensible decisions in the mountains. I’d let myself down this time and I felt truly ashamed of my actions. Not only had I put myself in unjustifiable danger but I’d been prepared to let Wilki descend the mountain solo, an inherently dangerous task. 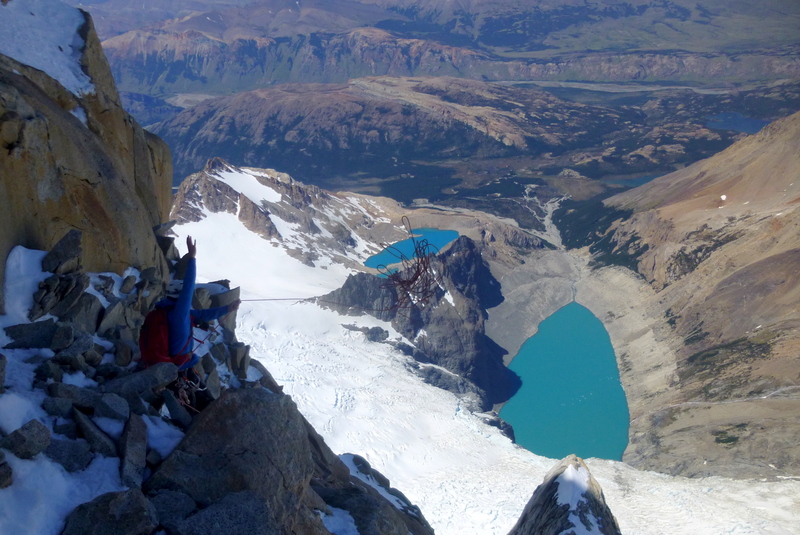 Feeling very sombre, and with a huge amount of adrenaline still pumping through my veins from my near miss, we packed up and trudged back over the summit to access the top of the Whymper Couloir- our descent route. It was now getting late and the sun was close to setting, my thoughts once again turned to Niall and Muzz, they must be worrying about us, wherever they are. I was pulled out of my thoughts by an unexpected sound and the sight of two shapes that my brain couldn’t quite figure out at first; two dark blobs 50m below me that certainly hadn’t been there earlier in the day. To my amazement, and immense relief, the words came from Niall as he led a very weary looking Muzz up the final snow slope towards the summit. 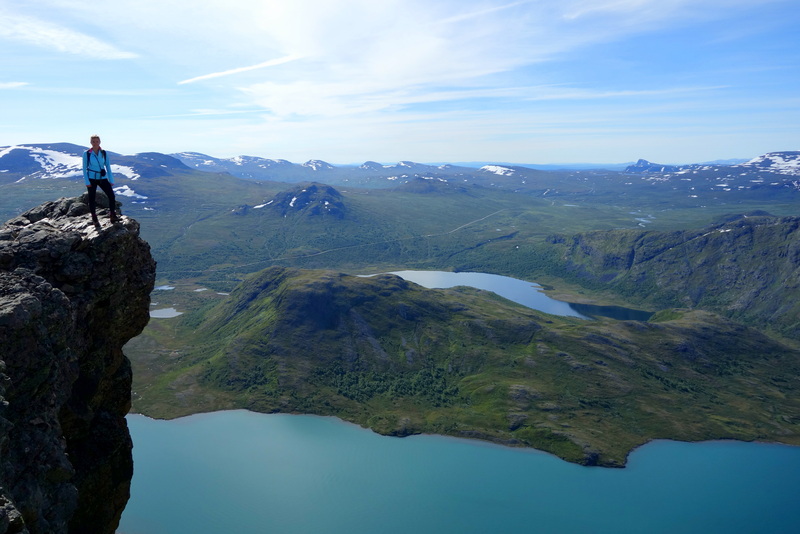 They’d been climbing for 16 hours and were massively dehydrated and hypoglycaemic, the one thought keeping them going was that the summit was the finish line; from there it’d be just a 3-4 minute flight back down to safety, or so they thought. I felt truly sorry for them as I broke the news that the conditions weren’t right for flying and we were all going to have to descend on foot to the south. Little did I know just how long. 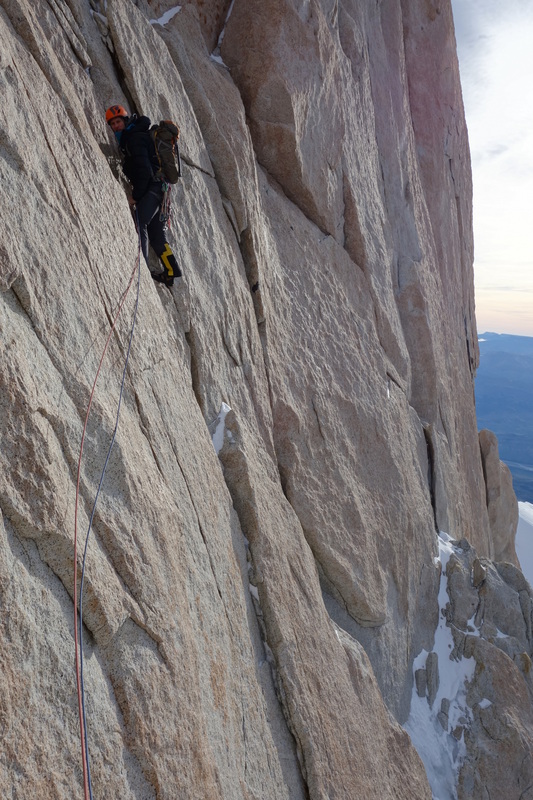 Wilki and I had descended the Whymper Couloir at night once before, back in 2012, so I had a bit of an idea of what to expect and set off ahead of the others to scout the route as the light faded. 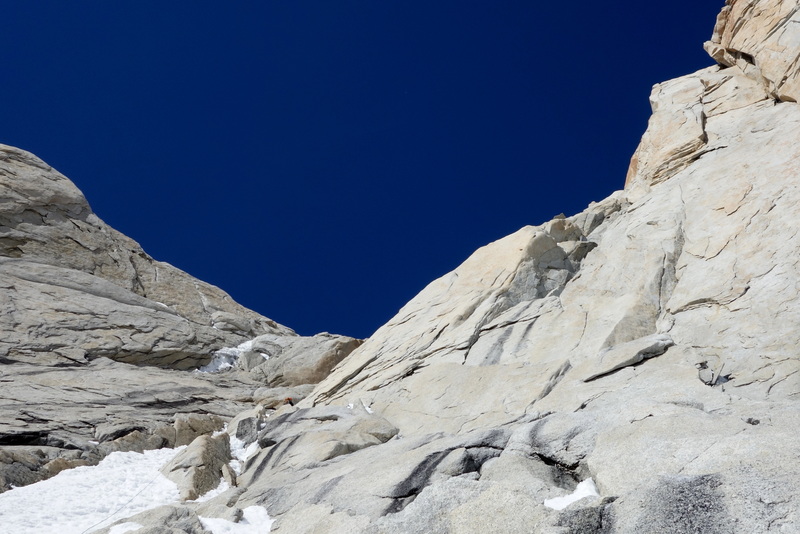 Unlike the frozen snow and ice on the north face the snow on the south side was soft and deep making it easy enough to solo down climb; that said, a trip or slip would be bad news as the couloir ends with a series of cliffs which you wouldn’t want to fall over. 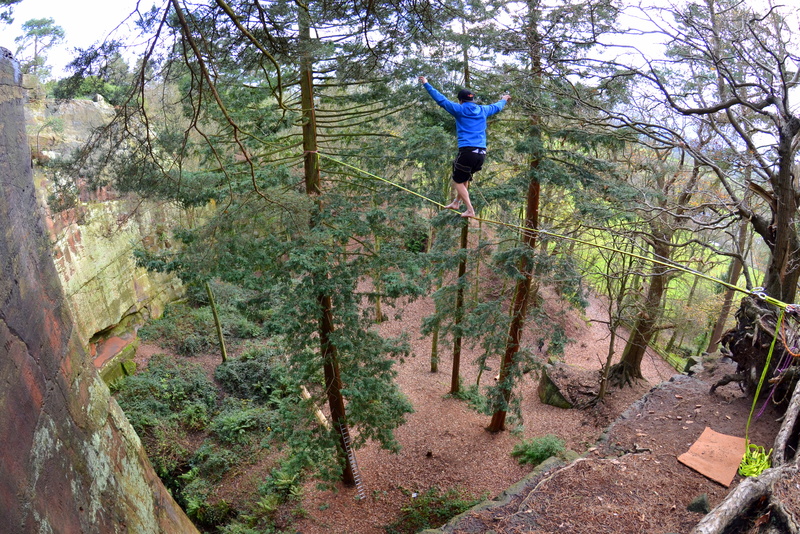 After a few hours of down climbing we finally reached the cliffs and set up an Abalakov thread to abseil off. 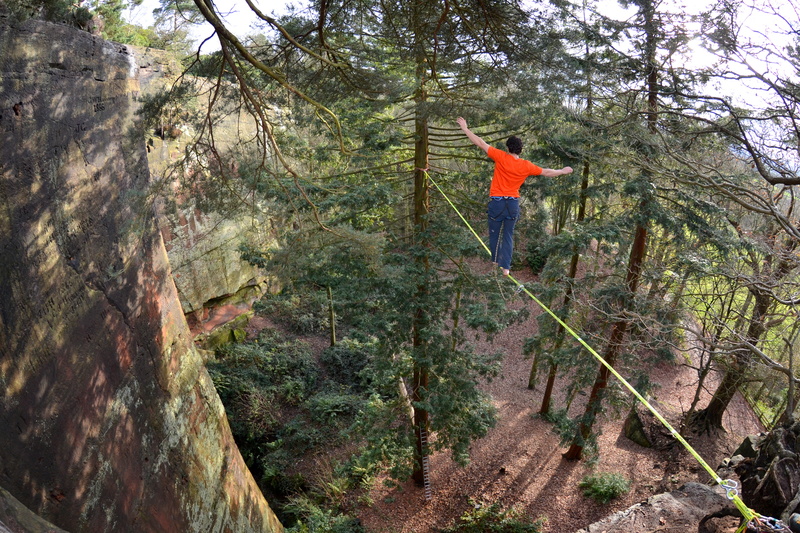 I rapped first and called up to let the others know that the rope reached the bottom of the cliffs and it was safe for the next person to come on down. The first person to appear out of the darkness above me was Niall looking and sounding much chirpier as he descended the last few metres of the cliff towards me. I’d been worried about him for the past few hours as he was clearly feeling quite jaded as a result of his dehydration, so it was a relief to see him looking more alert and energised. My relief was short-lived. 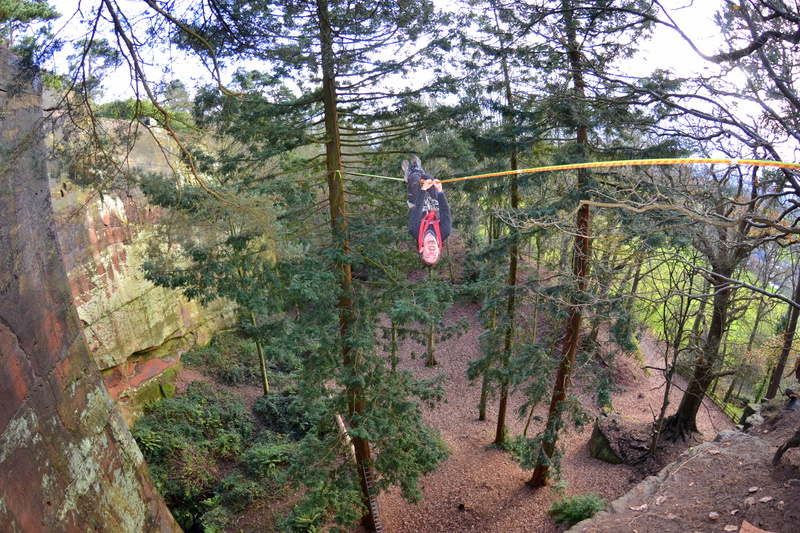 As Niall lowered himself down the last few feet of rope I gave him a little warning that he was nearing the end but he clearly didn’t absorb my comment. 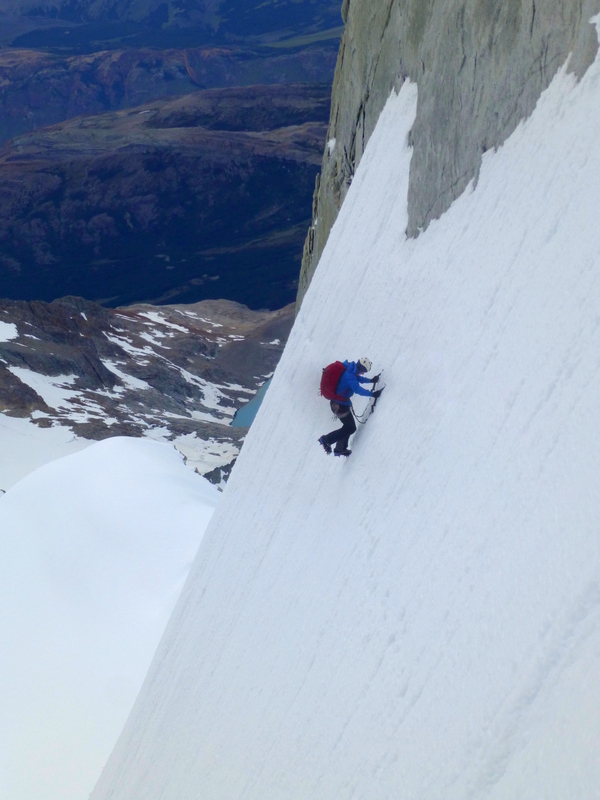 He told me later that he had thought he was abseiling down to flat ground – the very bottom of the mountain – but the reality was that at the bottom of the cliff was another 300m slope leading down past the bergschrund – a giant gaping crevasse. 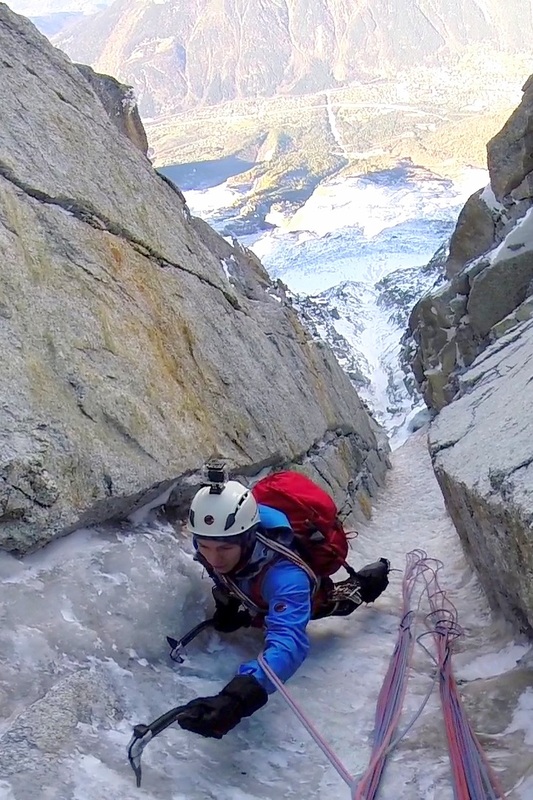 I watched in horror as Niall abseiled off the end of the rope and started tumbling down the slope, building speed with each second as the time between his impacts lengthened. Before I could even properly absorb what was happening he had disappeared into the darkness beneath me. Had I just watched Niall plummet to his death? 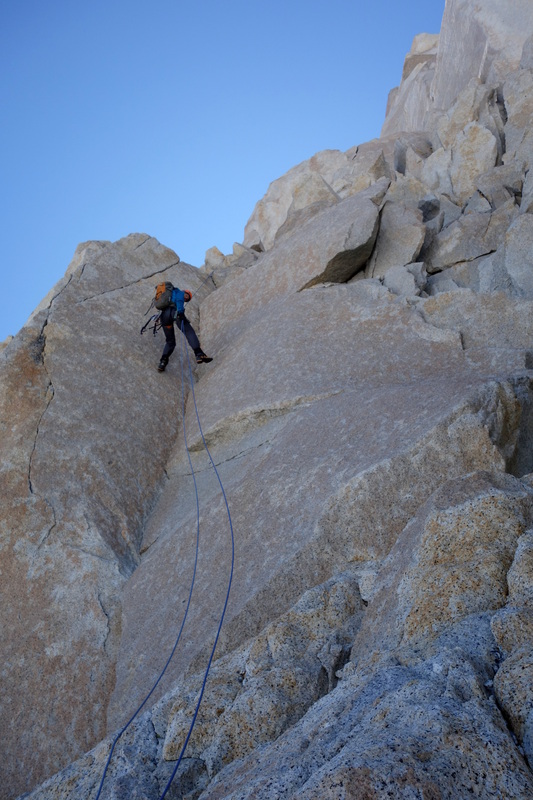 I set off down-climbing in a panicked frenzy, my mind a mess of dark thoughts. After 20 seconds I stopped climbing and shouted down into the darkness. I had no expectations of receiving a reply but to my amazement I heard Niall’s voice rising up from hundreds of metres below me. His voice was reassuringly strong and a wave of relief flooded over me. We exchanged a few more words before I continued my descent unconvinced that he could possibly be as unscathed as he was suggesting. I followed his path of ‘body-prints’ down the slope for 200m – amazed at the distance between some of his impacts – until I reached the bergschrund. Niall didn’t realise it but he had cleared the bottomless abyss with one massive flight before continuing his tumble for another 100m! For the second time that night I had to tell Niall that it wasn’t over yet. We still had a long trudge down the glacier to get to the Couvercle Hut, a little shack with beds and rugs where we could get some kip. It was 4 hours before Niall finally got off his feet and got some rest. 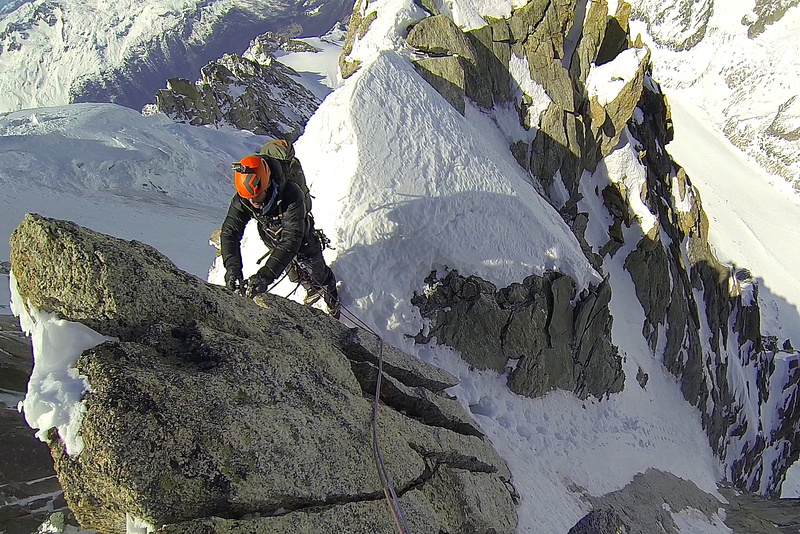 We had left the Argentiere Hut 26 hours earlier. 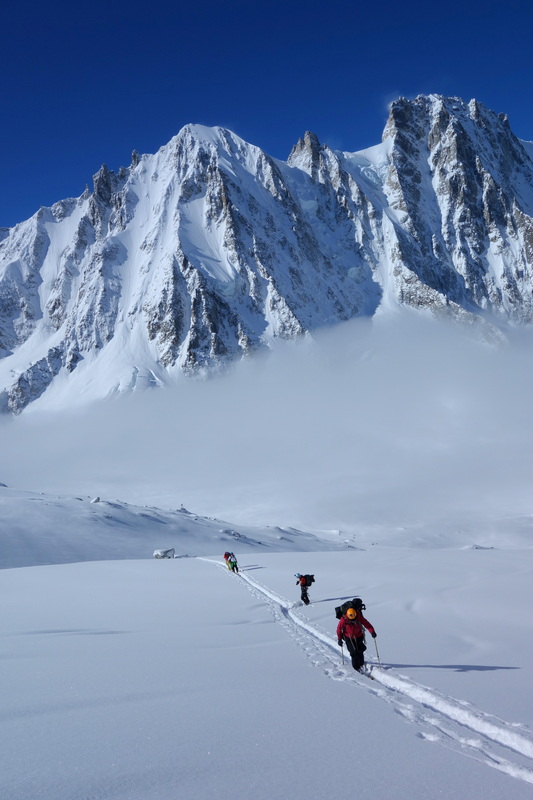 Despite the beautiful weather, I felt pretty subdued the following morning as we sedately strolled down the Mer de Glace to the Montenvers station. 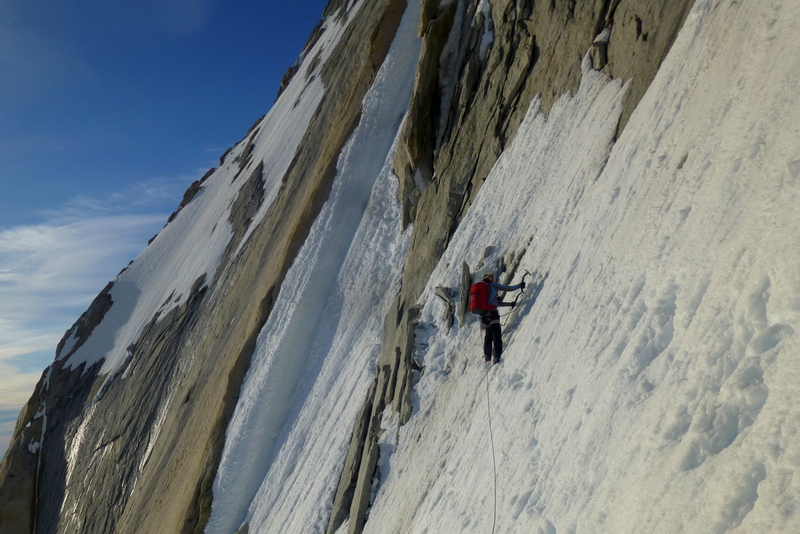 I had been so excited about this trip and the prospect of taking ‘speedwing alpinism’ to the next level. In hindsight I would say I had been too excited, and too determined to make it work. I had been building myself up for a big fall. 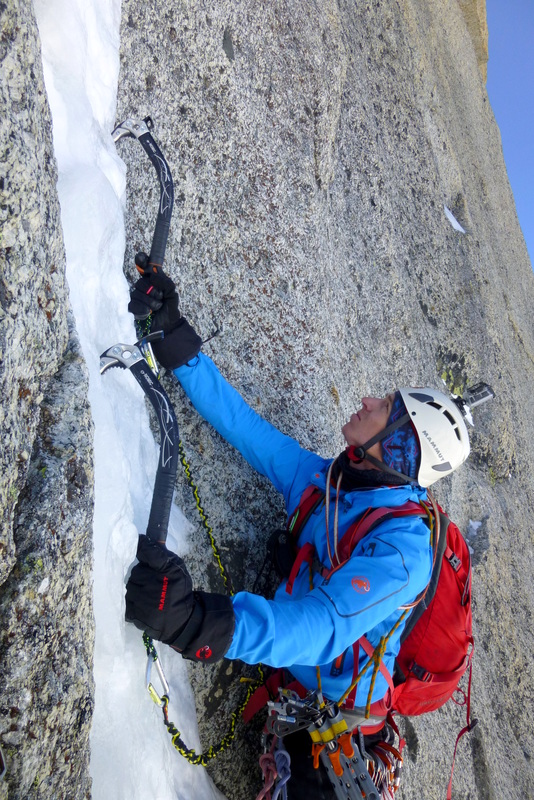 The reality is that ‘speedwing alpinism’ can work, but it should never be assumed that conditions will come together to make it a viable option, one should always assume that it will be necessary to descend on foot, and only if everything is absolutely perfect should a speedwing descent be considered. I was disappointed with how the trip had gone; I felt that Mammut would be unimpressed with how little I had to show for all their support; I felt I had let down my family and Lucy by taking the enormous risk of trying to launch in spite of the dangers; I felt I had been hugely selfish in being prepared to leave Wilki alone on the mountain; and on top of all this I felt that my over ambitious ideas for using the mountains as a playground had nearly got Niall killed. We achieved all 3 of the above on this trip and had some pretty cool experiences along the way. I’d count that as a success any day! I need to finish this post with a HUGE thank you to Dan and Nida who not only sacrificed a beautiful mountain day to film us on our climb, but then had to spend the whole night that followed wondering what on earth had happened to us, and the majority of the following day ferrying all our gear down to town where we were busy stuffing our faces at a local restaurant. Dan and Nida, you’re absolute legends! It’s the middle of winter. The days are short. The weather inclement. My finger injury persists. But fear not! Fun can be found even in the darkest of times. Here’s a short film documenting some mid-winter McCantics (guest appearance from Glen Harper) in our wonderful home county Shropshire. 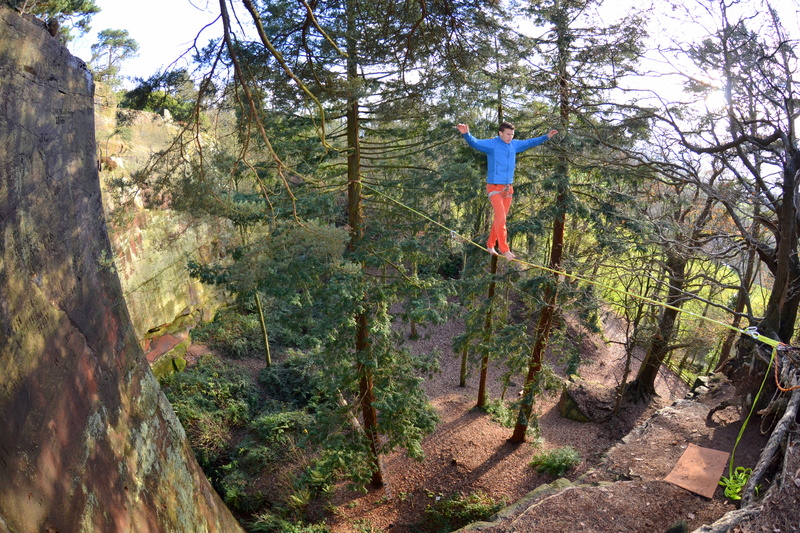 Speedflying and highline slacklining… enjoy! In other good news. 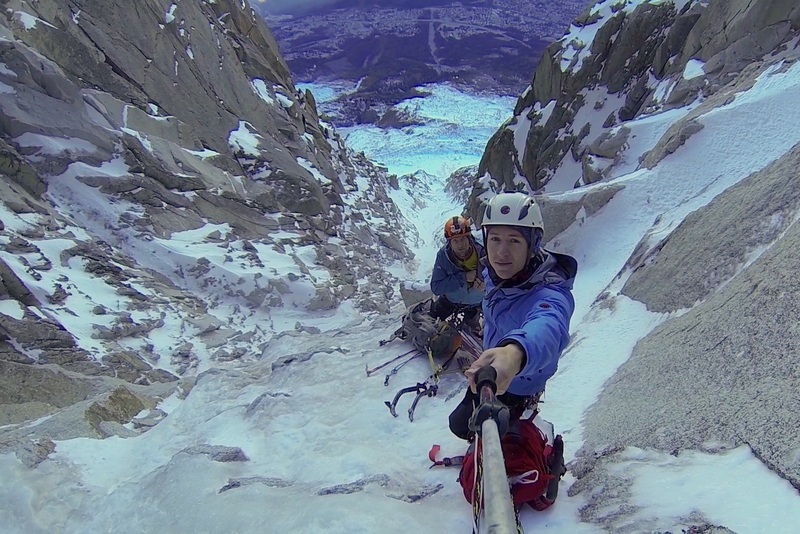 Our film ‘Arctic AIR’ documenting Niall’s and my adventures in Greenland has been short-listed for the Vancouver International Mountain Film Festival, the Sheffield Adventure Film Festival, the Adventure Travel Film Festival, and the Echo Mountain Film Festival… in Macedonia! If you’re interested in viewing it yourself please visit Arctic AIR- SteepEdge where you can rent or download it for a very reasonable price! 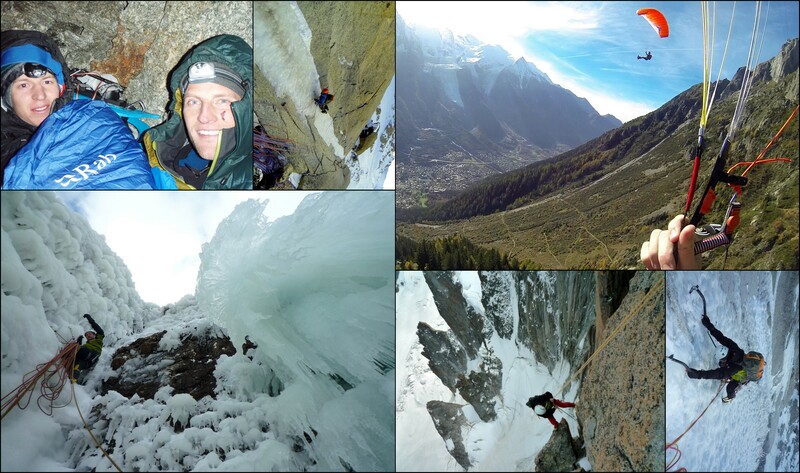 A big well done also to my Mammut team mate Ethan Walker who has just won the 2014 Trespass Blog Awards! Nice one Ethan! Last year I sustained some serious tendon damage to my right hand meaning that I was forced to take 12 months out from rock climbing. 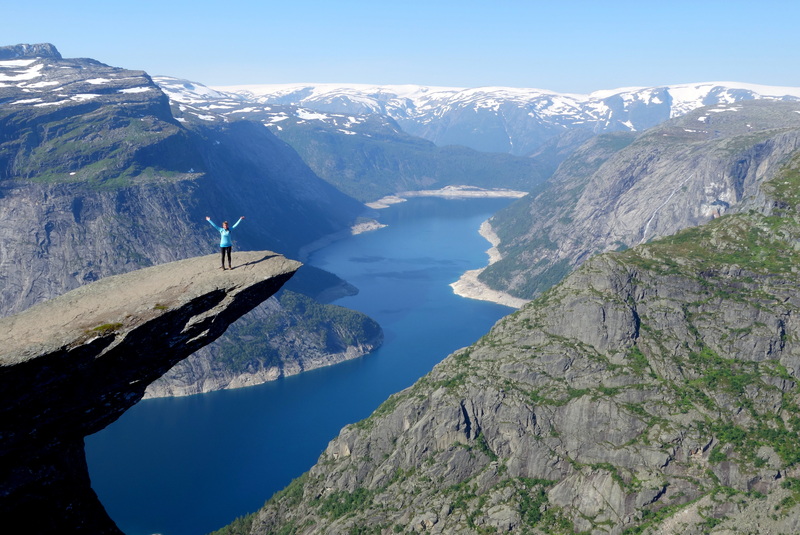 At first I was understandably devastated as rock climbing brings me so much happiness and fulfilment on a regular basis, but it wasn’t long before I opened my eyes to the opportunities that came hand in hand with this set-back. Because I wasn’t going to be able to rock climb I figured I may as well dedicate myself to learning a new skill which one day could compliment or even enhance my climbing exploits. So that’s the back story to how I got into speedflying. 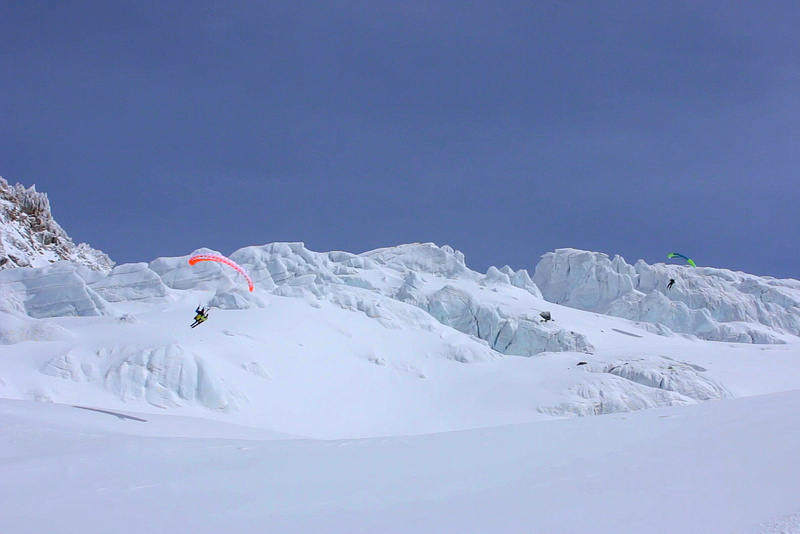 This spring’s expedition to Greenland opened my eyes to the unbelievable fun that can be had when combining mountaineering and speedflying. 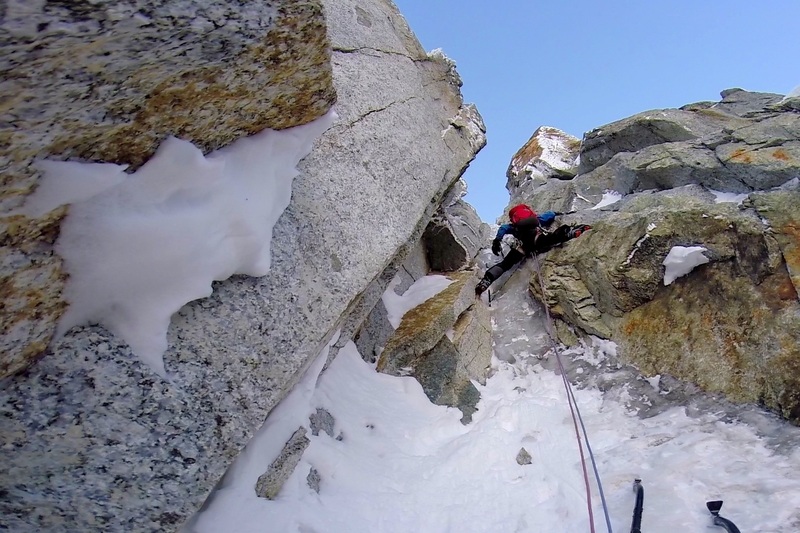 My mission now is to really push this discipline, which I’ve named ‘Speedwing Alpinism’, to a whole new level. 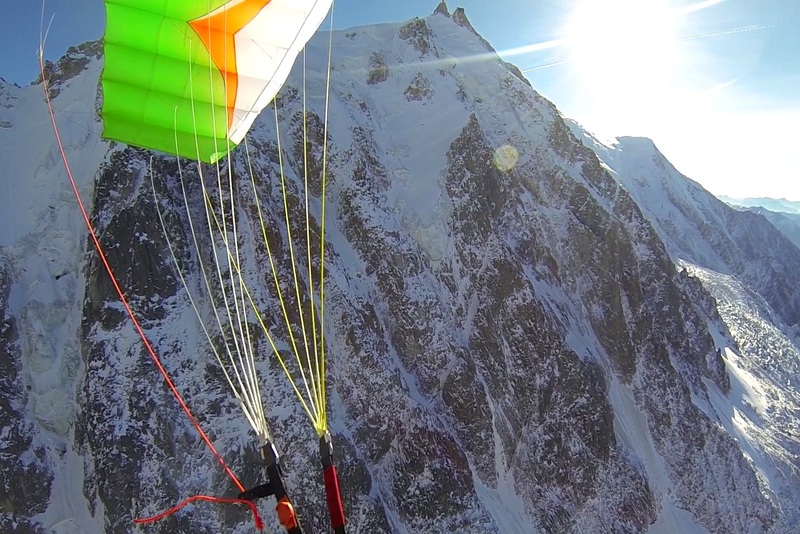 A few weeks ago I drove out to Chamonix with my alpine climbing buddy Wilki to explore the possibility of foot-launched speedwing alpinism. 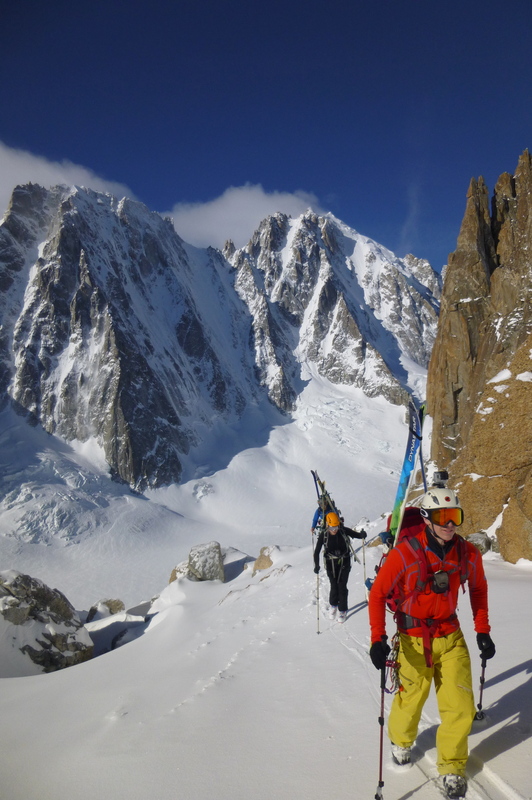 Up until now all the alpine launches I’ve done have been on skis, but this itself precludes you from climbing particularly technical routes (climbing with skis on your pack and ski boots on your feet isn’t fun). 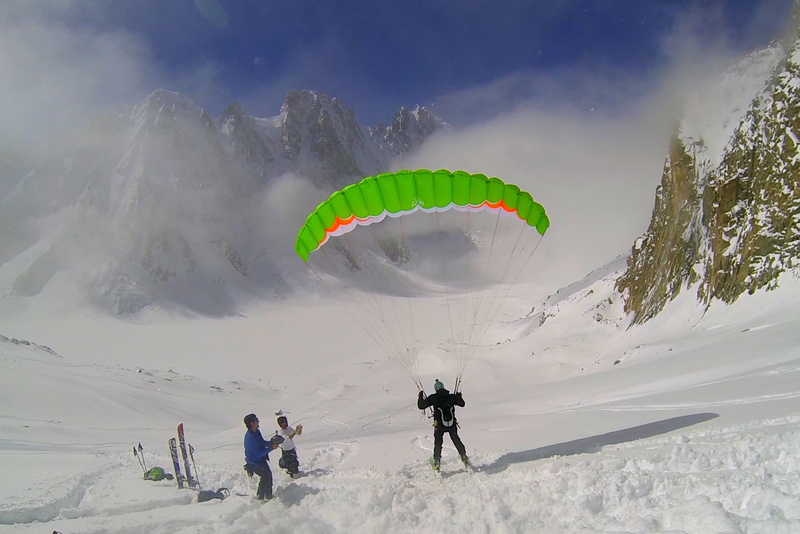 So our question was this: when attempting a flight from a snowy alpine summit, can we run fast enough to launch our wings by foot? 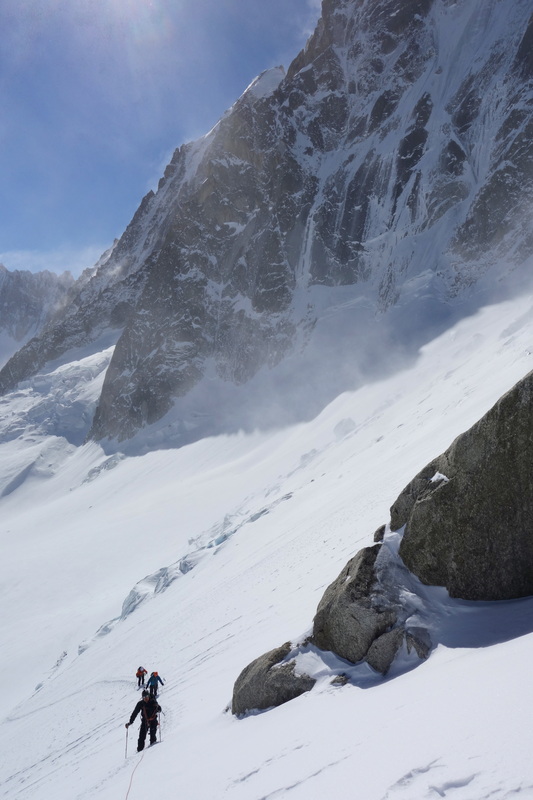 We intended to climb the North Face of the Grandes Jorasses and launch off the top, but a heavy dump of snow and a Northerly wind put an end to that plan. 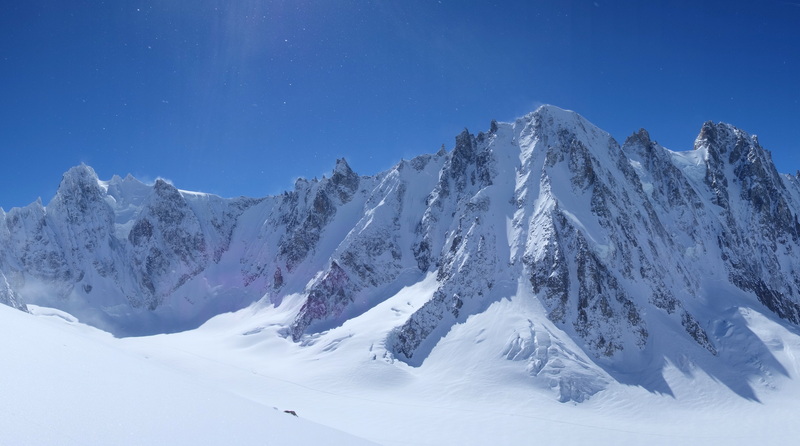 There are no North facing launch sites on the mountain, and the South side would have been dangerously avalanche prone meaning that we would have been climbing into a trap where we could neither fly off nor safely descend on foot to the South. 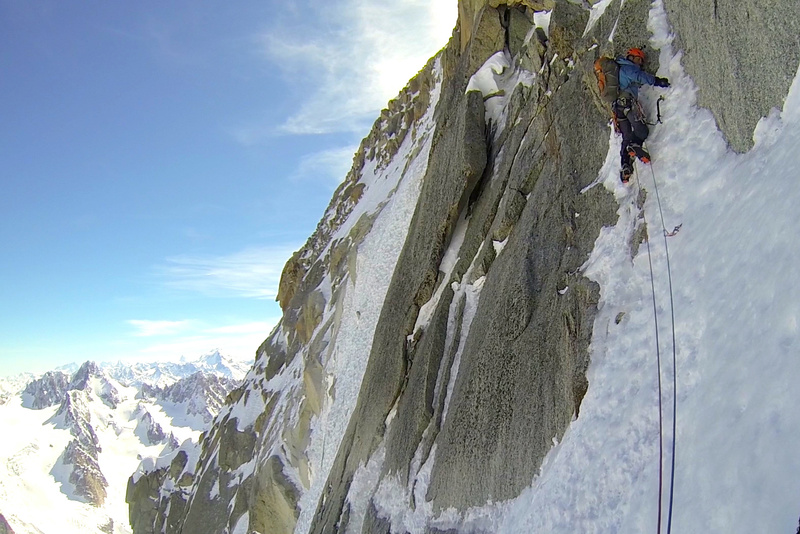 So with only two days of good weather to play with we picked out the Eugster Direct on the North Face of the Aiguille du Midi. The climb got off to a bad start as I was hit in the shoulder by a head-sized lump of granite which had fallen from 20 metres above me. The impact knocked me off my feet leaving me hanging upside down from my ice-screw and ripped a hole through three layers of clothing. At least it didn’t hit me in the face! Adrenaline got me through the rest of the day as my shoulder slowly stiffened up. The rest of the route went wonderfully smoothly. 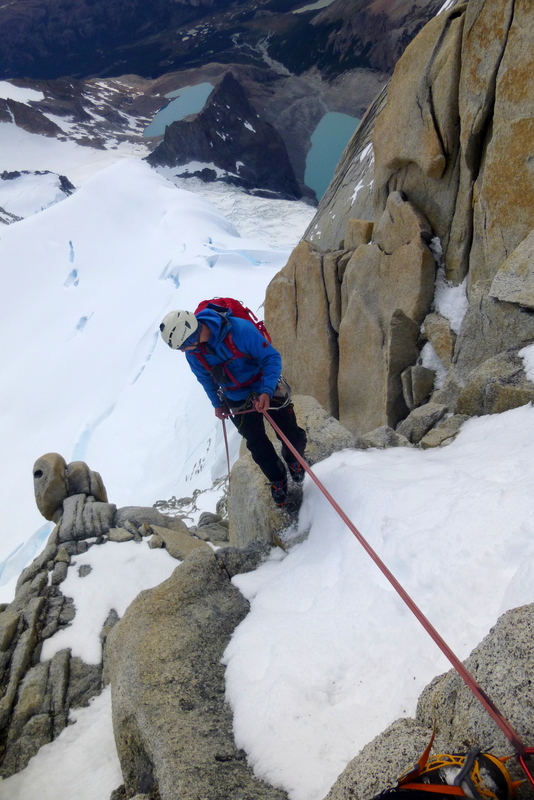 The route was in pretty good condition with only a few sections of very thin delicate ice which had to be climbed with great care, despite this we climbed fast and topped out onto the summit ridge before 3pm. Out came the wings and we scouted out a good launch area. Wilki drew the short straw and launched first, then it was my turn. 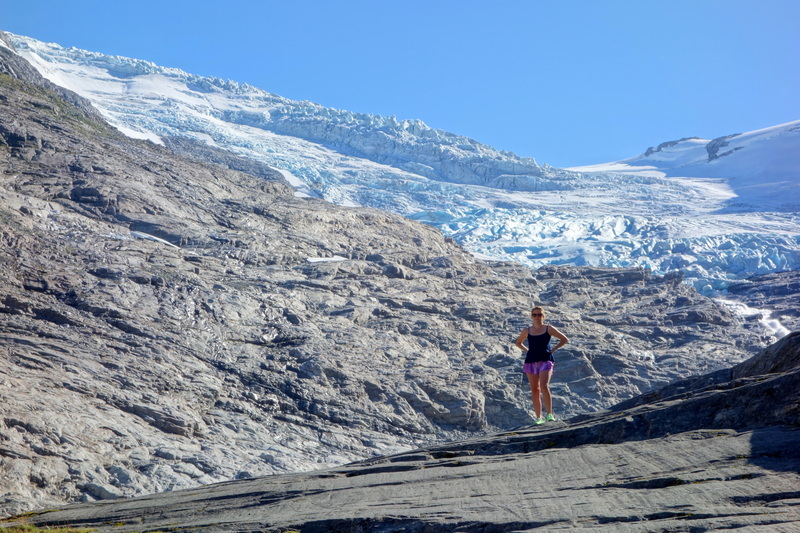 I must say it felt amazingly un-daunting running off the edge of 1000m mountain face! 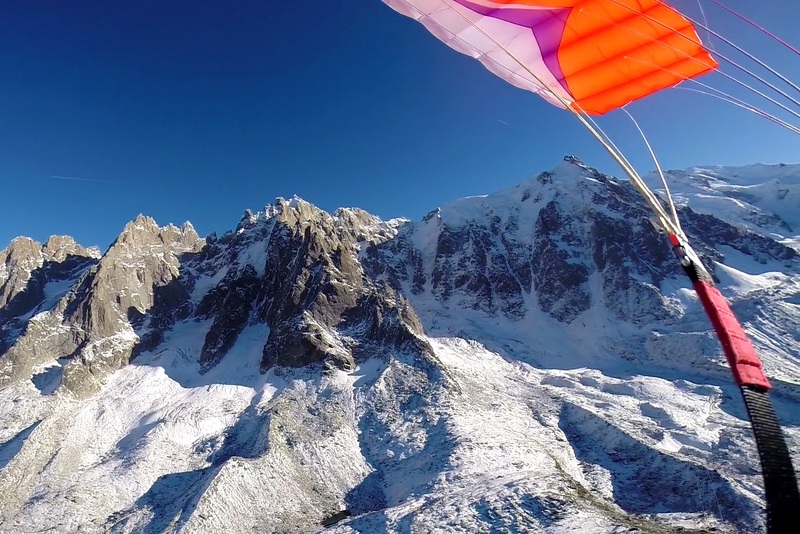 The views were spectacular and I didn’t want the flight to end, but 8 minutes and 2,700 vertical metres later Wilki and I simultaneously touched down in Chamonix. So, the experiment worked. 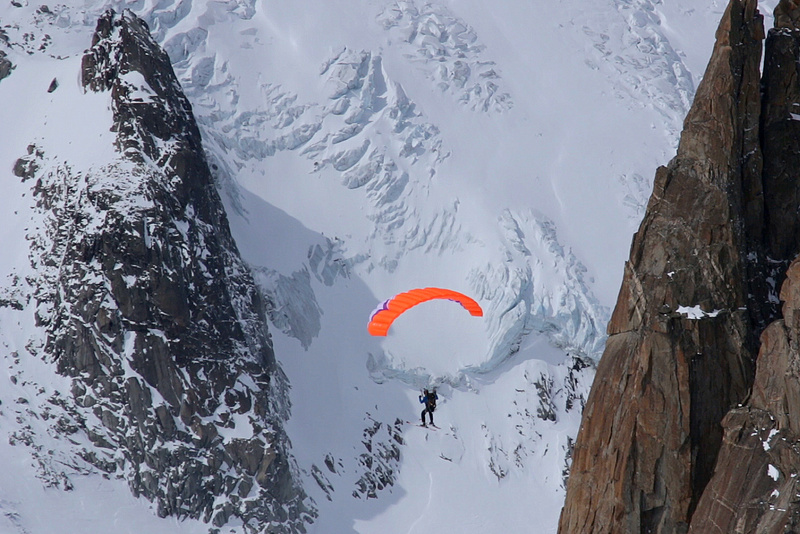 Foot-launched speedwing alpinism is a goer! Now let’s see where we can take it!